The Interpret This! 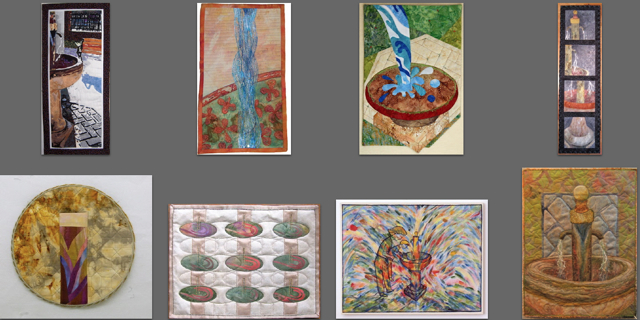 Challenge was a yearlong challenge during 2010 among 9 quilters. 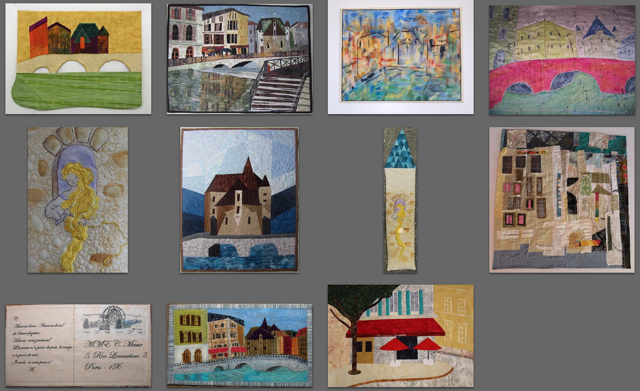 The goal was to interpret a photo each month with fabric and thread. 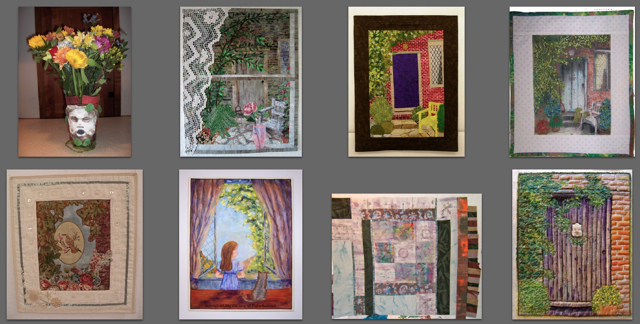 The interpretation was solely the decision of the quilter and the monthly progress was kept a secret until the end of the month when each piece was revealed. Color ...... Color is a prime element in my work ...... there is no Color that I don't like ...... my world is full of Color! Periodically through the years, I've attempted to do a self-portrait. Each time I ended up scrapping it. Need I say this challenge made me nervous about finally succeeding? It began with a picture taken by the camera built into my computer. This point of view seemed appropriate since my husband claims I spend so much time on the computer. He often sees me peering up over my glasses and the screen to acknowledge his presence ... or interruption. 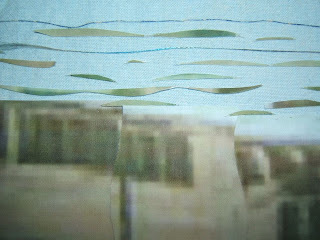 I started out to make a pattern and had planned to use fabrics to portray what I see in that photo. However, this had not worked for me in the past. 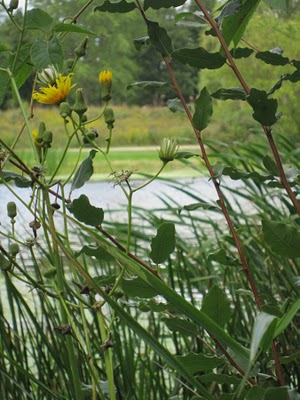 Now that I am more computer literate, I decided to play with the picture in "Adobe Photoshop Elements". The first photo in the above strip is the original picture. The next one shows it "posterized". Then I gave it "poster edges". I played with all the filters in the "Elements" gallery. I liked the effect that happened to my hair in the photo on the left side in the frame below. For the life of me, I can't remember, nor figure out what I did to get that particular effect. I printed both of them onto paper with my Canon printer. After cutting and playing a bit I was sure that I needed both of them printed on fabric. 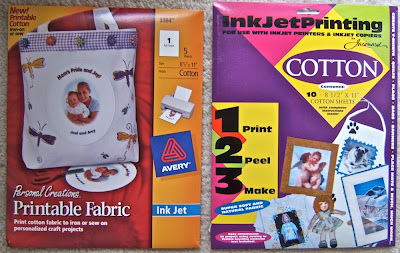 This was the first time I've used commercially prepared for the printer fabric. The picture of me on the left was transferred to one that was fusible (on the left below) while the picture on the right side was transferred to the fabric stiffened with paper (on the right below). 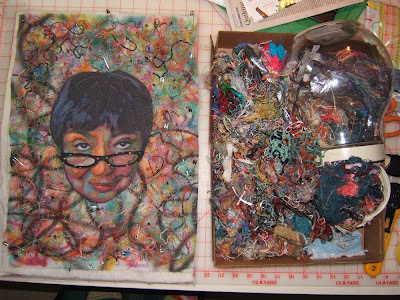 The unfused fabric portrait part of my face and hair was cut away from the background. Just portions of my highlighted hair were cut from the print with the fusible. Fusing those pieces of hair to the other printed hair took the highest heat setting on my iron and a longer time than I've ever used for the fusing process. I traced the outline of my glasses from one of the paper photos onto the paper of a fusible web over a lightbox. That was then ironed onto a polka dotted fabric. The dots were colored with permanent markers. 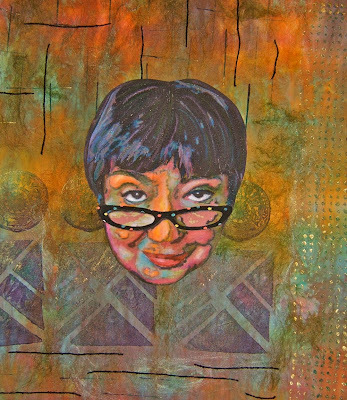 Then the glasses were cut out and fused over the pair on my fabric printed portrait. I also softened some of the "posterized" edges and added more highlights to my hair with oil stick pastels. Then played with various backgrounds. 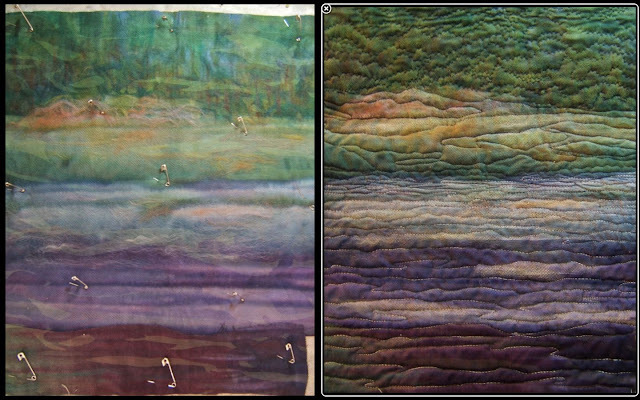 The fabric in the above photo is one of those extra special pieces in my stash. I love the marks and designs on it. However they were not made by me so I didn't use it. The one that I had airbrushed loops and squiggles on won out. My signature "ortwork" technique of scattering bits and pieces from previous projects had to be a part of this piece. 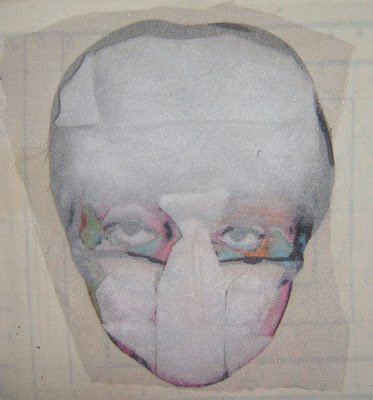 Before the collage process, I sculpted my face with layers of batting. There are more layers over my hair and down the center of my face, while there is none on my eyes. The piece of netting is there to hold the layers of batting so they would stay in place while when I positioned it on the background. The excess around the edges was trimmed away. Another layer of tulle netting on top holds all the bits and pieces as well as my padded portrait together. Selecting a soft violet colored tulle softened the strong and harsh colors as well as the hard edges. This subdued element more accurately portrays my personality and outlook on life ... both are definite, but not harshly expressed. 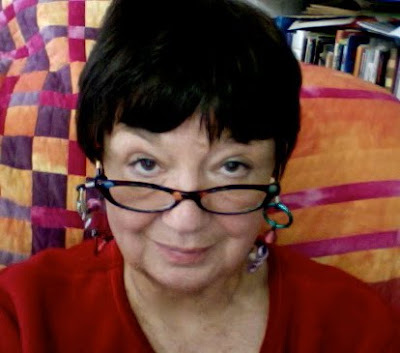 I free-motion quilted around my silhouette as well as around the eyes, down one side of the nose, the smile line between the lips and along the bottom edge of the glasses with a dark monofilament thread. 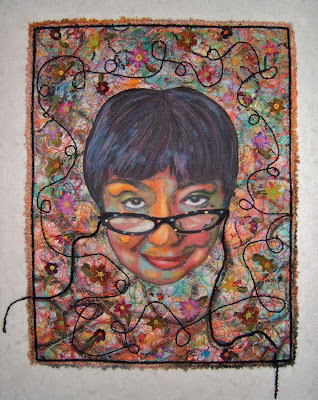 A loop pattern in the background with a variegated thread was done too. Then flowers were added to the surface by free-motion quilting their centers. Finally, defined squiggles and loops were added by couching yarn to the surface. A heavier black yarn that had dots of color in it was couched in place to become the holders of my glasses. Also, a lot more blending and highlighting with the oil stick pastels as well as some ink work on my face was done. 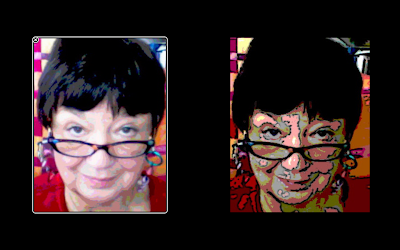 Finally, here are the original photos next to my finished portrait. I'm pleased the final piece doesn't mirror its origin. They all look like me, but there is so much more in the piece of art ... it projects how I feel on the inside rather than what I actually look like on the outside ... a view of me from the inside out. I grew up in the era of adults admonishing children to "Clean your plate. There are starving children in China." Consequently, no morsels get left on my plate ... and that's what I brought to my interpretation of Rian's chosen photo of a sumptuously filled plate. Also, I've dined in some elegant Chinese restaurants here in the states and in Hong Kong so I've experienced their ornate and gilded decor ... another element I chose to feature from the photograph. The first thing I did was convert the photo to black and white to determine the balance of values. A strong contrast of light and dark dominates with a lesser amount of middle values. My piece has the same balance but with a different distribution ... the middle values ended up concentrated in the red panel on the side. I was curious to use an automatic color generator just to see the palette of the original picture. That was fun. The site lets you browse for and download the chosen picture and then gives this kind of result. As you can see, I chose a limited palette. There's no violet listed. But since it was part of the fabric that I wanted to use for the table top and it had wonderful spots of "reflection", it became part of my piece. The value works and it looks great with the metallic gold. 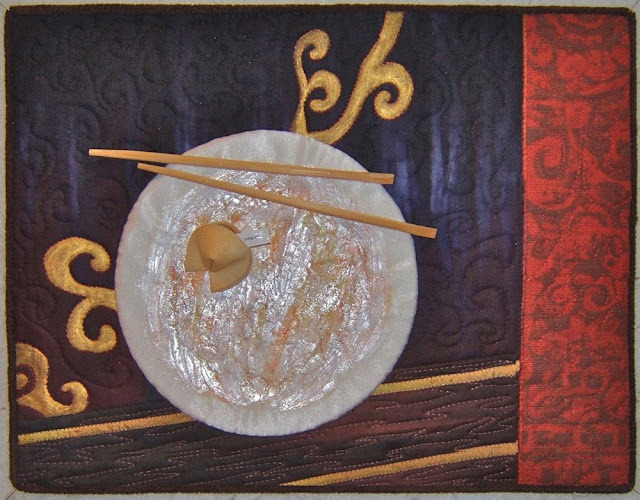 The plate is made from a silk crepe. 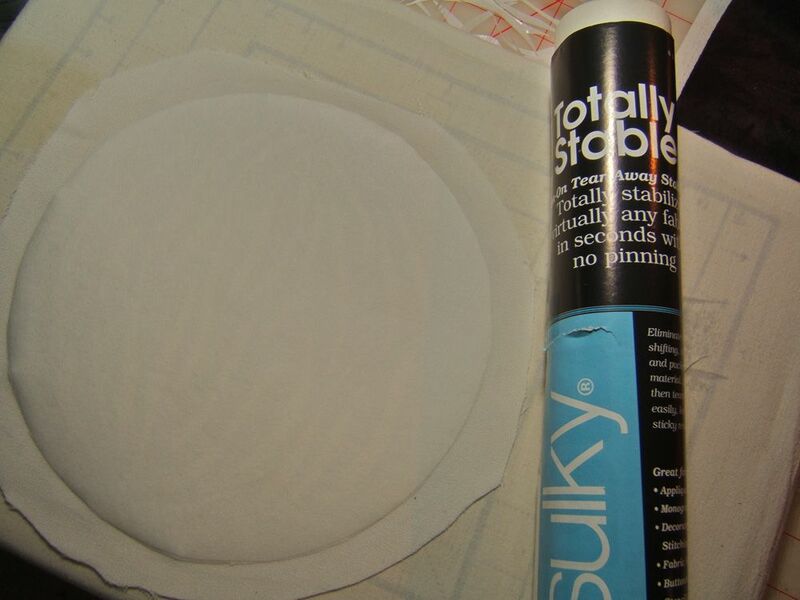 I stabilized that soft, draping fabric by ironing two layers of Sulky Totally Stable cut in circles the size of the plate. This is a paper product and intended to give fabric stability for machine embroidery. 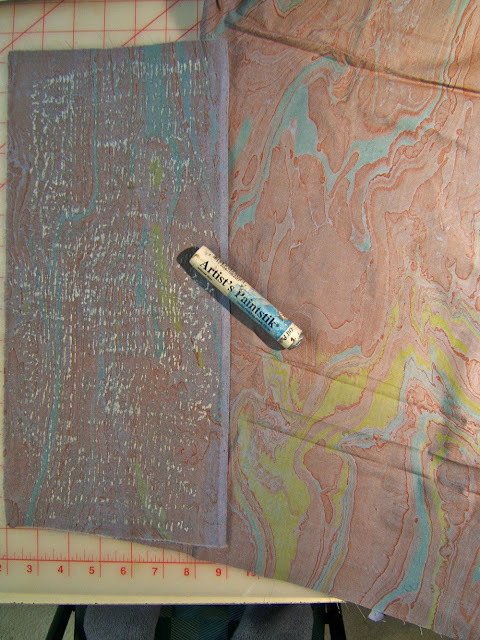 Now, I wish a heavy-weight fusible fabric had been used instead of paper. There are wrinkles in the plates edge because Sulky's paper stabilizer came loose and wouldn't "refuse" again. I wanted the outside edge of the plate to be raised. Just a circle of batting almost did this. I ended up inserting another circle cut from light-weight cardboard to stabilize that edge. 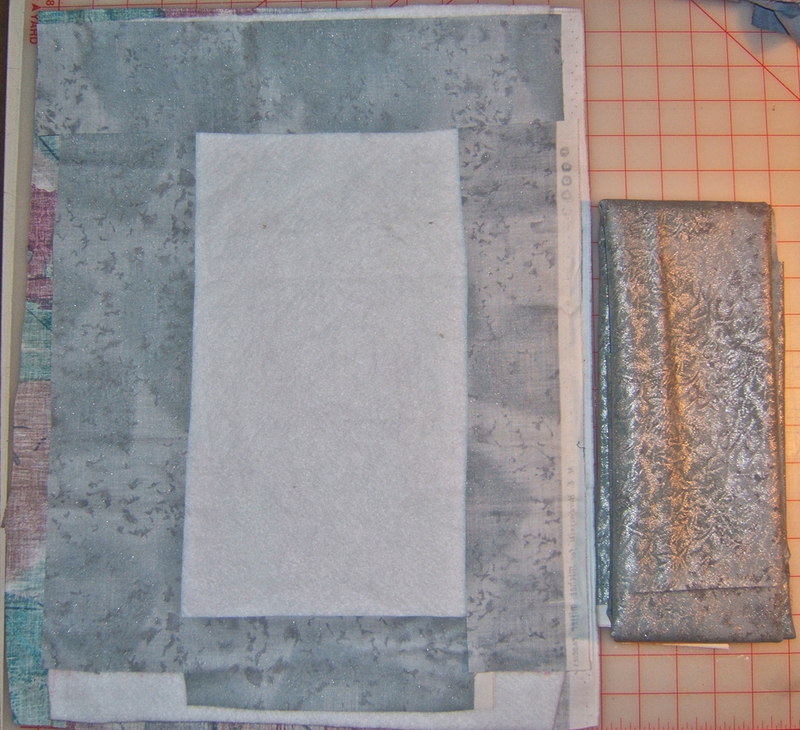 In the meantime, the silk was clipped and glue basted to the underside of the plate. 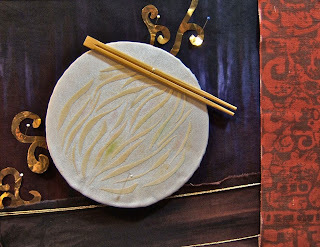 The coloring on the plate to indicate the presence of food was done by smudging oil stick pastels onto a cloth and then rubbing the pigment on the plate. 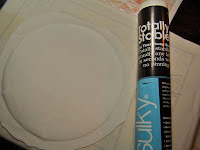 I also used white acrylic paint with shimmer and then coated it with acrylic medium to leave the sheen of a dirty plate. Initially, free-form cut pieces of cotton were fused to the plate. 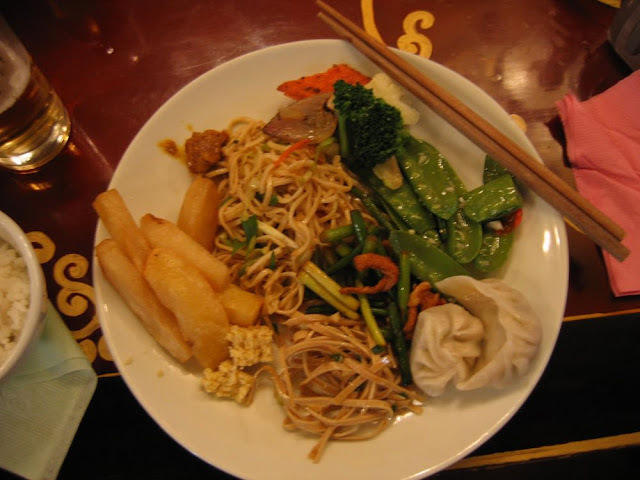 I thought those would give the effect of tracks made by the chop sticks having scraped through the food. That's not what happened so they got buried under layers of pigment and paint. The foil paper from a chocolate wrapper was cut into the spiral patterns that decorate the table top. I could move the paper shapes around to play with their placement. I also used a length of gold cord to indicate the lines on the edge of the table while I was composing. 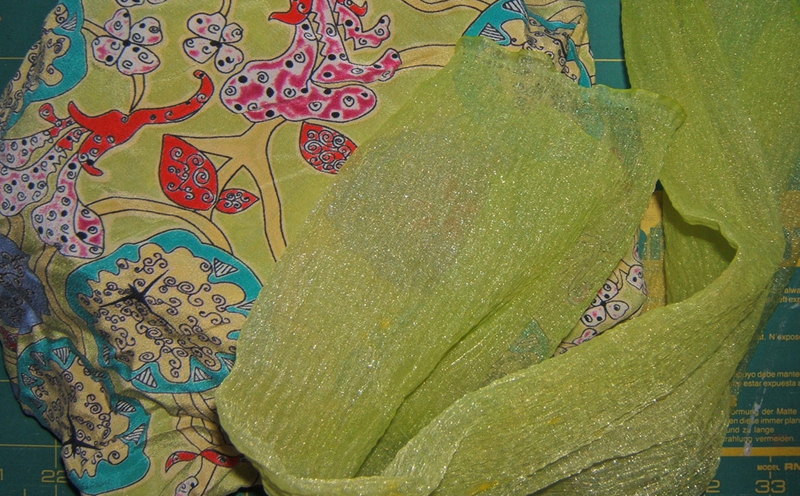 The final piece has French hand-dyed silk ribbon couched in place by machine. 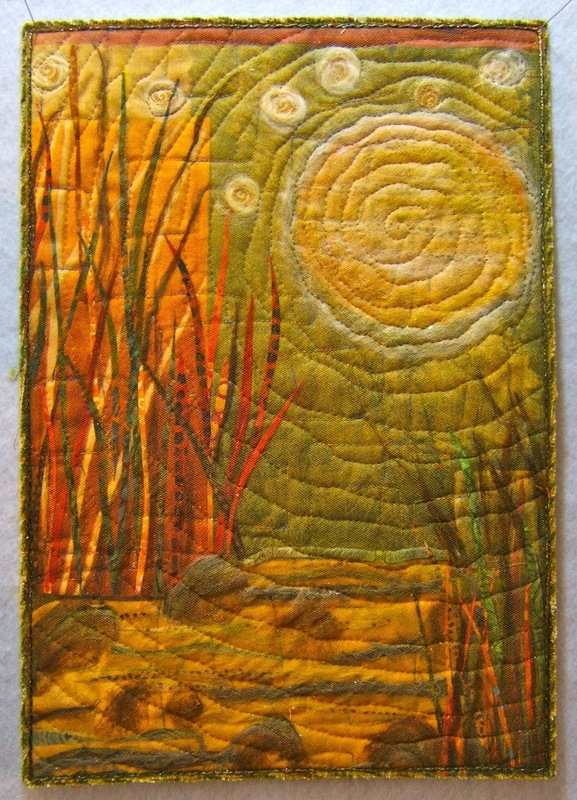 I traced the gold paper spirals on the background and machine quilted them with a heavy red thread. The red side panel is also quilted with that same thread. Slightly smaller spiral patterns are machine quilted in the background of the table top with fine black thread. A mixture of metallic gold pigment powder and fabric medium is painted inside the quilted spiral patterns that decorate the table. I love the precise effect of quilting, then painting for this piece. There was good coverage with just one coat and the fabric is soft, not stiff, where it's painted. The wooden chop sticks are sewn on with clear mono-filament thread. A strip of red-orange chenille yarn is couched over the seam of the side panel. That fabric, by the way, was an accidental discovery. 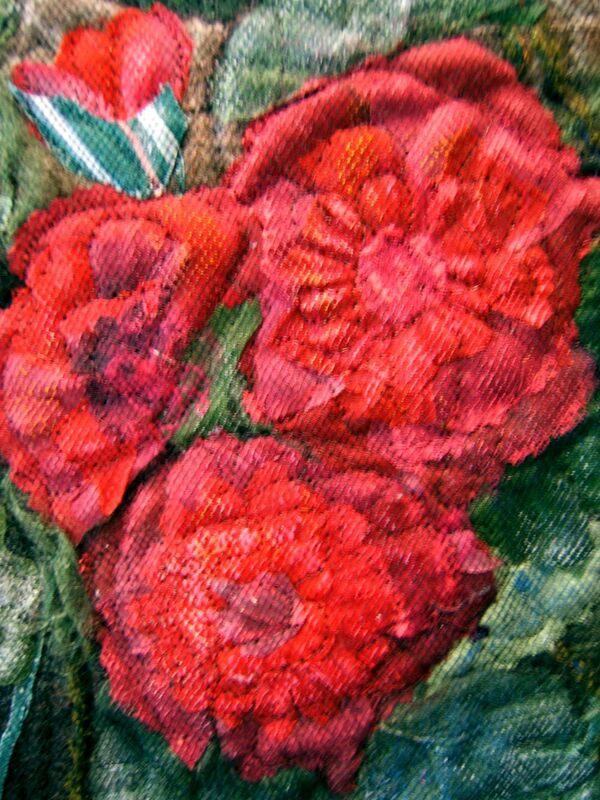 It's part of an old outdoor cushion cover made from fabric I had bought in Hawaii a looooong time ago. I had dug it out to use as the backing for this piece. It just happened to be laying in the right place for me to see that the widest stripe would be perfect for the front. The outside edge of this piece is finished with a heavy brown chenille yarn couched by machine. 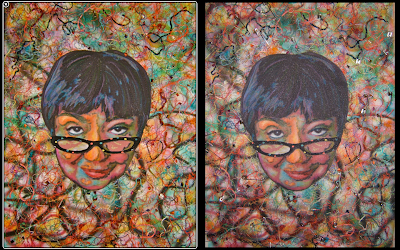 I've used the same dimensions (17"x 13") for this second challenge as I did for for the first one, my self-portrait. I intend to use this measurement for all the rest as well. The orientation of the rectangle will vary according to the subject. Dolls. I love dolls. I've collected dolls. I've restored dolls. I've made dolls. I've dressed dolls. This photo of dolls delighted me. Consequently, I didn't stray far from the original for my interpretation. To begin I printed out two copies of Kay's photo in various sizes. Each of the paper dolls were cut out. I found fabrics in my stash that represented the table, box and crate, and background drape. 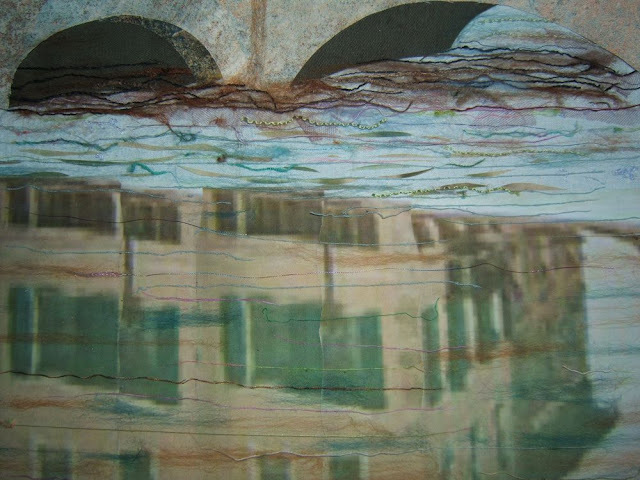 Those fabrics were cut and arranged to portray the structures within the photo. Wool roving was pulled apart and used to shade the cotton fabrics. Then I began to play with the paper dolls. The red cone at the left edge of the photo puzzled me. I have no idea what that is. However, it reminded me of the doll wearing a red silk gingham dress sitting on my dresser. I took her photo, then printed and cut it out. She filled that space nicely, repeating the shape and color of the unknown object. She also made this piece personal to me. There was another personalization that had excited me early on. Initially I thought this was the perfect opportunity to finally use all the doll legs that were saved from the many Christmas tree top angels I had made over the years as gifts ... they all had smocked gowns and hand-made battenburg lace wings, and a cardboard tube from the waist down. Those added doll parts to the layout on my table looked good in digital photos that were taken to record the placement of all the paper cutouts and porcelain legs. However, when they were attached to the actual surface after the piece was quilted, those dimensional legs were distracting. Actually, they stood out like sore thumbs. There is one doll in the photo that is draped with lace. I have drawers of lace ... both old and new. However, I couldn't find a white piece that was the proper scale, but there was a wonderful very old black lace that was. Studying the paper cutout composition, I determined there needed to be a focal point in the lower right corner to balance the large doll heads, my doll, and the black doll heads. I took my clue for her placement from the black metal rod that cuts across the corner in the photo. 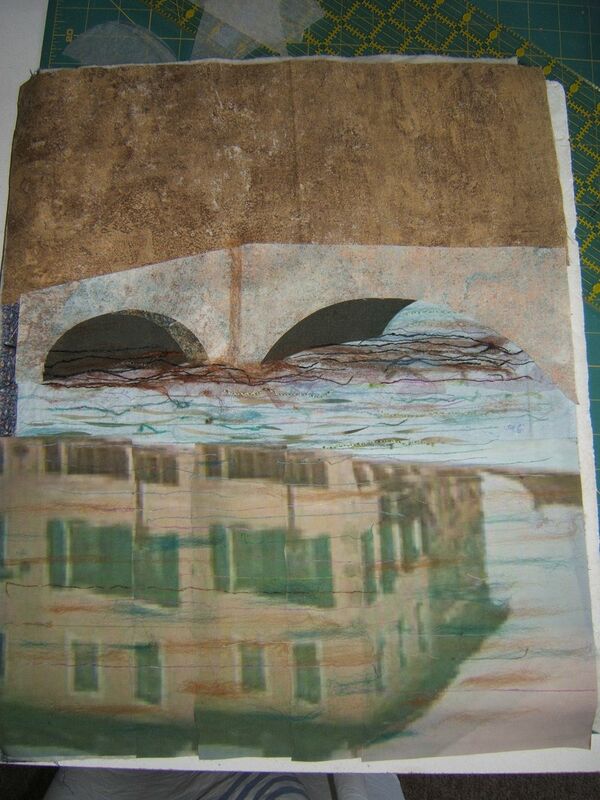 The construction of this piece is a collage technique. All the elements, both background and foreground are cutouts, roving, and thread ravels that are arranged and then held in place with a surface layer of tulle netting. Machine quilting holds all the layers together. 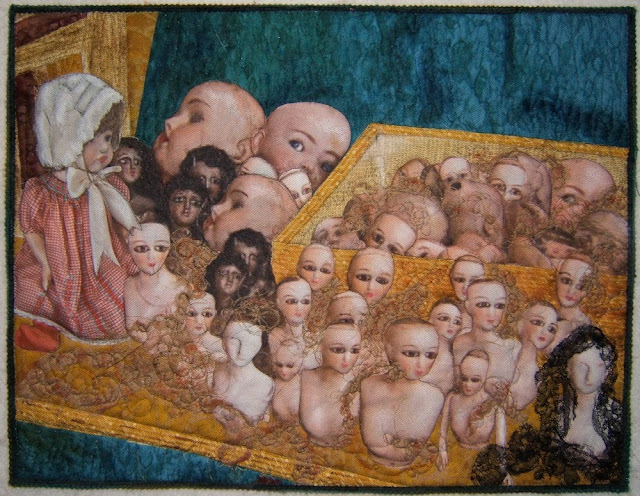 Within the dolls faces there is very little quilting. Most have just the line under the eyes quilted. This softened their gaze by directing it slightly downward. After the fact I found out that I could have requested an image with a higher resolution than the 40 KB of this one to reproduce. As it is, my solution worked better for my purpose ... there's more of me in the fix which adds my hand to those dolls painted faces. 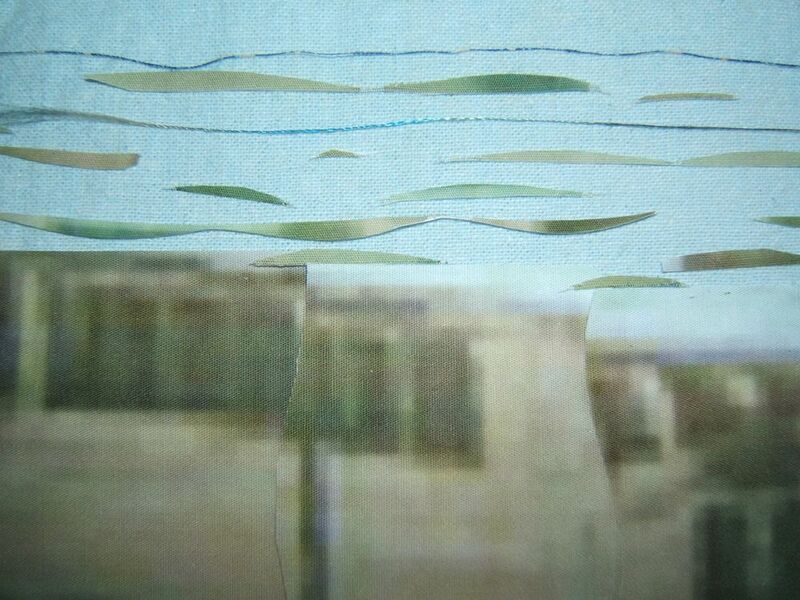 The images I printed on fabric were pixelated. I fixed that by "drawing" over lines with watercolor pencils and markers, then shaded and highlighted with oil stick pastels. 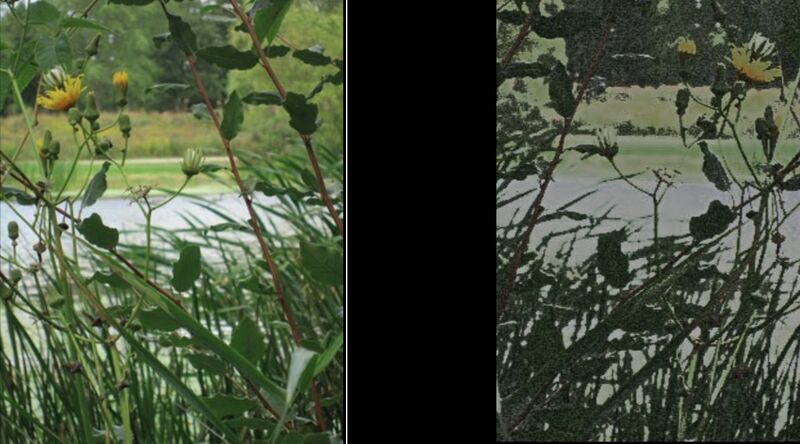 Of course, the outside edges were smoothed by the process of cutting the image out of the whole picture. 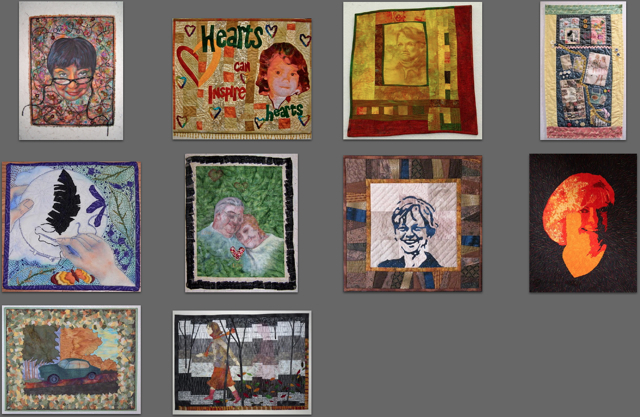 Then too, quilting lines have something to contribute, as well. 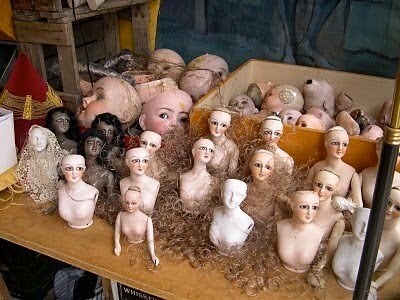 As for the title, I have the sense that all these doll parts are "waiting" for the doll maker(s) to come back and make them into completed dolls ... like the one sitting on the end of the table. 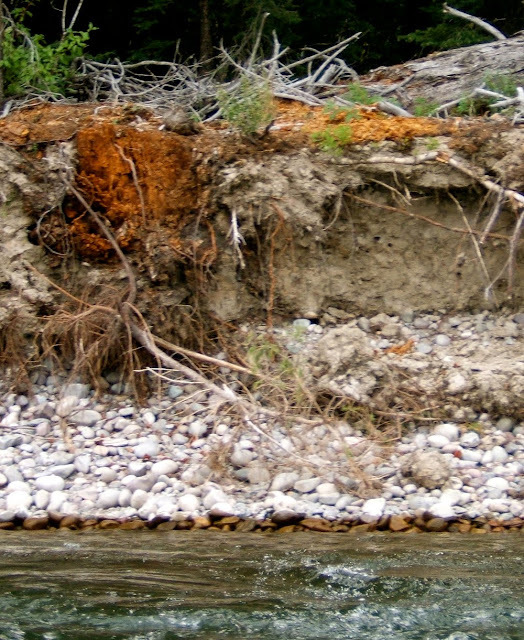 A crumbling bank along the Snake River in Jackson Hole, Wyoming. Strata (side 1) 13"x 17"
Strata (side 2) 13"x 17"
I have loved this photo that I took of a crumbling bank while rafting the Snake River in Jackson Hole, Wyoming in 2006. The exposed strata of rocks, soil and roots above the clear running water intrigued me. And of course, I knew just how I wanted to interpret it. But wait ... what I had in mind is what a lot of people would expect me to do. I like a challenge, plus participation in this group is pushing me to stretch beyond my comfort zone. It began with a quick sketch of proportions for the elements in the photo so I could scale them up to a larger size. Years ago I had set aside this set of decorator fabric samples for some project in the future. All those smooth round stones in the photo made me think of the circular patterns in that fabric. I wondered what the whole picture would be like if it was made only from circles. It is the only fabric I used and was fussy cut to get the coloration needed for the different elements. Now I have a bunch of scraps that look like Swiss cheese. The process of getting it together is the same as I had done for last month's doll piece. The raw edged pieces are arranged on the batting, then a layer of tulle netting is laid on top. Quilting holds the layers together. Scraps. I really am hooked on working with scraps. All the while I was composing this, I really, really, really wanted to interpret that picture with my "ortwork" collage technique ... in the way most everyone expected. Sooooooo....I flipped the piece over and collaged the backside from this bag of scraps. Because I had not intended to do this, there were complications caused by the lack of planning. My first thought was to quilt the more realistic terrain lines with a dark thread in the bobbin so they would show up on the circle fabric side. 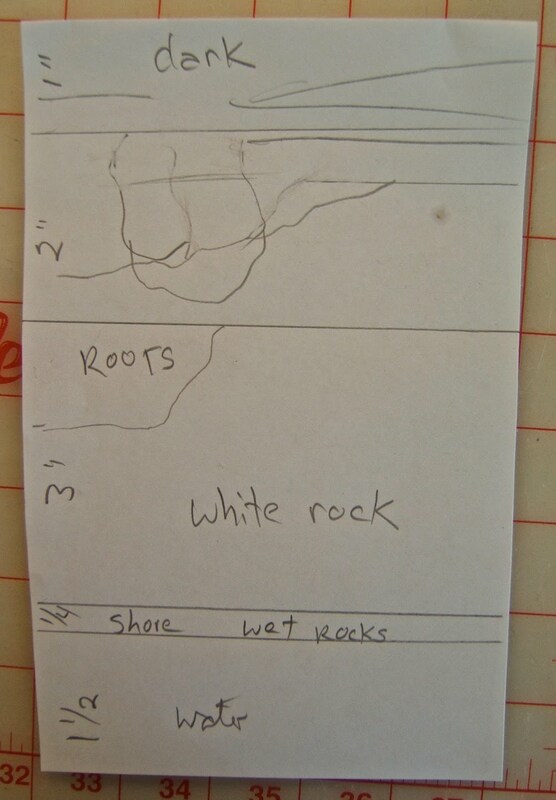 However, I had not reversed the image for the back side, so that idea was out. I ended up moving the front side composition with the circle fabrics to another piece of batting. Then I quilted each piece separately ... the natural lines of the terrain and elements on the "ortwork" back side and around the circles on the "front" side. The two were connected together in the process of couching the yarns that finish the outside edge. I left about an inch unstitched on each side so there is an opening for a stick to pass between the front and back pictures. The ends of the stick extend beyond the sides of the quilt for hanging on two nails. There are a few lines of quilting through both layers that meander through the center of the quilt to keep them together, as well. I like both versions and am glad I explored a different path for interpreting what I see in this photo. However, I'm partial to the "ortwork" one. I feel awe at the transformation of those bits and pieces that would normally be discarded. 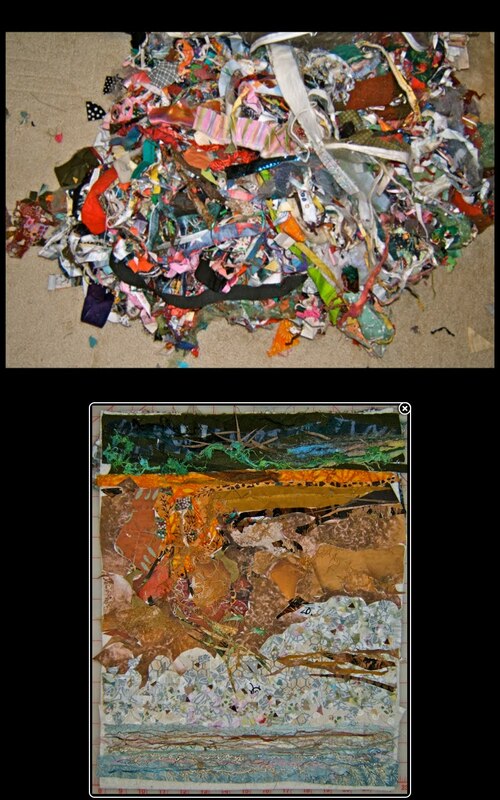 Beverly had mailed a baggie of raveled threads that she trimmed from her dyed fabrics. The shrubs are the pulled apart tangles of the greens. 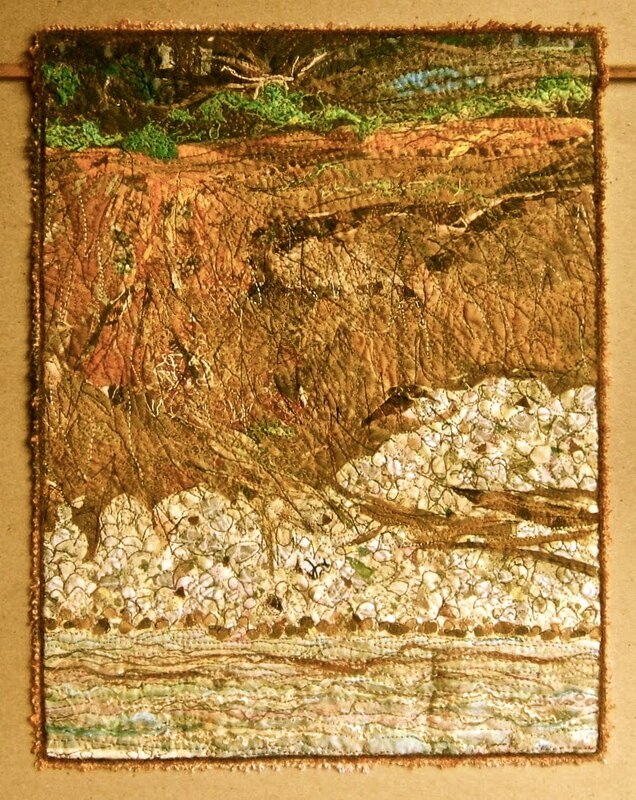 Masses of roots are represented by pulled and twisted gold cheese cloth she included. Thank you, Beverly. Pieces cut away from the photo transferred fabric for last month's challenge play in there, too. Also, each side is finished with different colors of tulle ... light blue on the circle side and yellow/orange on the "ortwork" side. 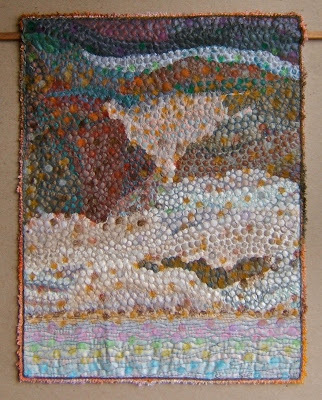 Strata II - 13"x 17"
I've always liked making interesting backings for my quilts. Creating a focal piece for a back is a first for me. Now, which way should I hang it for viewing? My interpretation of Libby's photo is limited to the end of one branch. 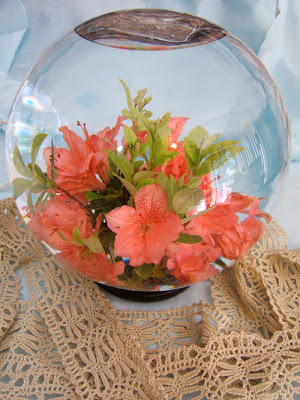 Those blossoms were "virtually picked and arranged" in one of my favorite vases ... a water globe. I had arranged stems of azalea blossoms in the globe for reference. For those who are not familiar with this type of vase, the stems of the flowers are inserted into holes of a black rubber base. 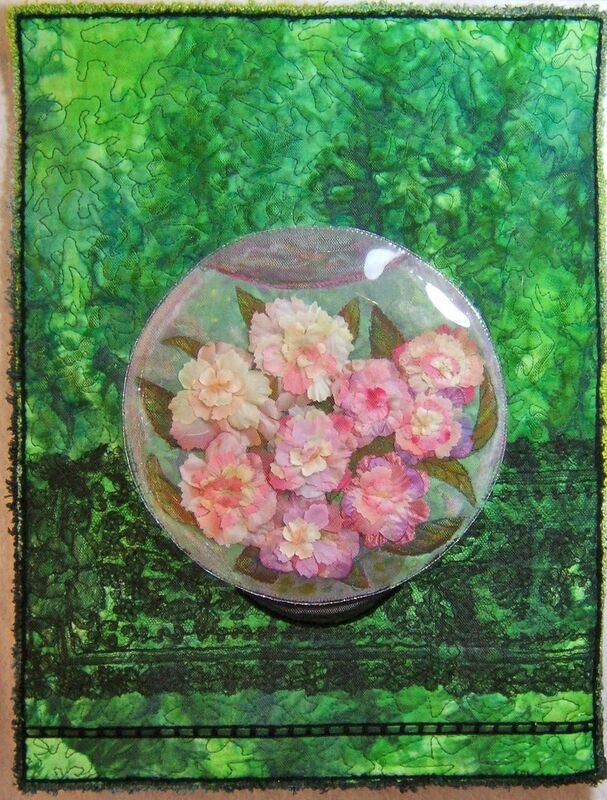 The globe is filled with water, then the arranged flowers are lowered into the water and rubber base is sealed around the glass opening. 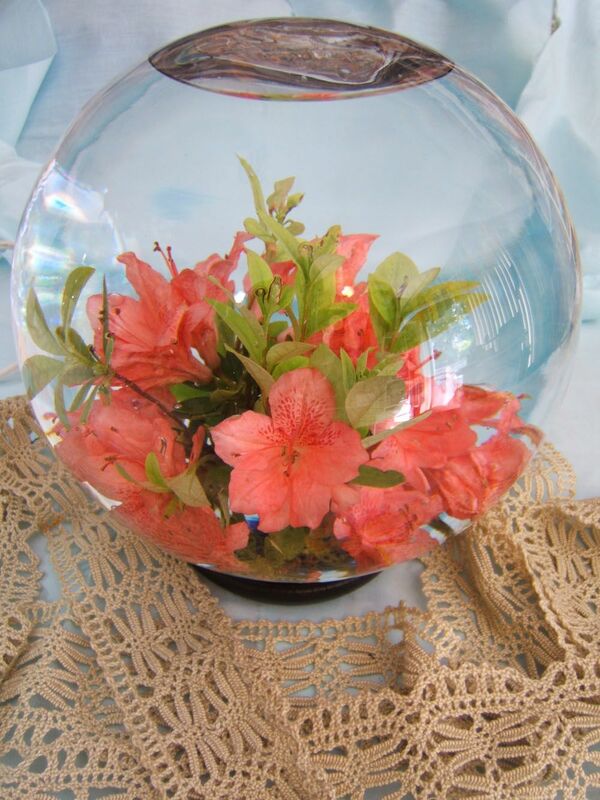 There's always an air bubble that gets trapped when the vase is turned upright. 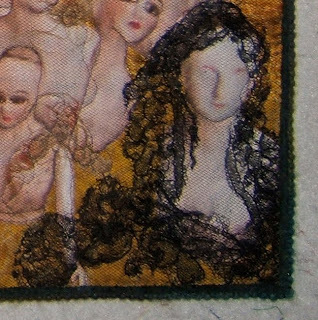 I included the heavy cotton ecru lace with the intention of making oil stick rubbings on fabric to duplicate the look of the shadows in Libby's photo. 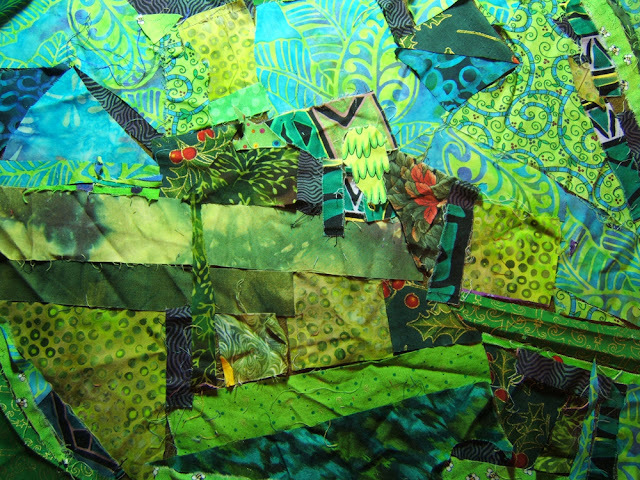 I couldn't believe the luck of already having the perfect piece of green batik with the look of shadows in my stash of fabrics. 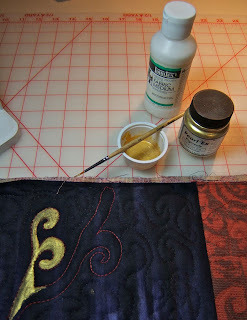 A piece of black cotton sateen was backed with a fusible and cut out for the rubber base, then fused into place. 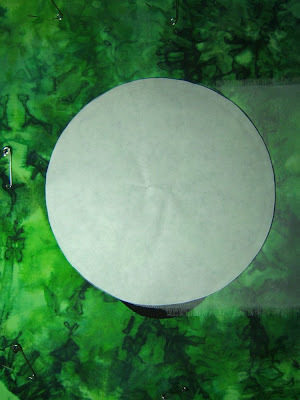 I drew and cut a template for the globe on freezer paper, then ironed the waxy side onto a piece of white silk organza. After it was positioned, I stitched around the outside edge of the paper template, then trimmed the excess organza outside the line of stitches. Now it was time to replicate that air bubble with another piece of organza. This was a scrap leftover from someones curtain making. 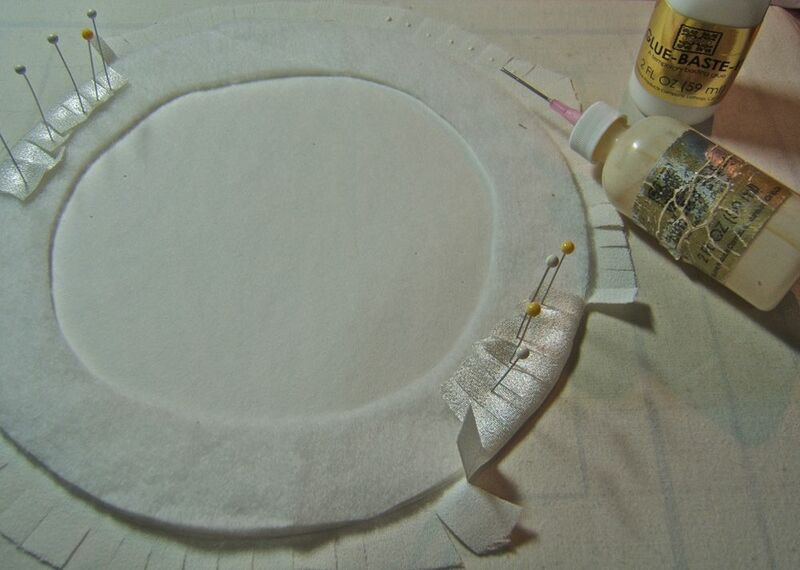 Again, a freezer paper template was ironed onto the organza. 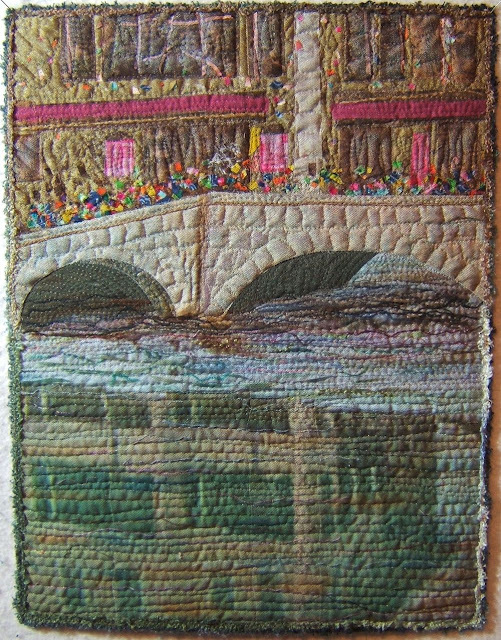 It was pinned into position and I machine stitched around the outside of the template and then trimmed away the excess. 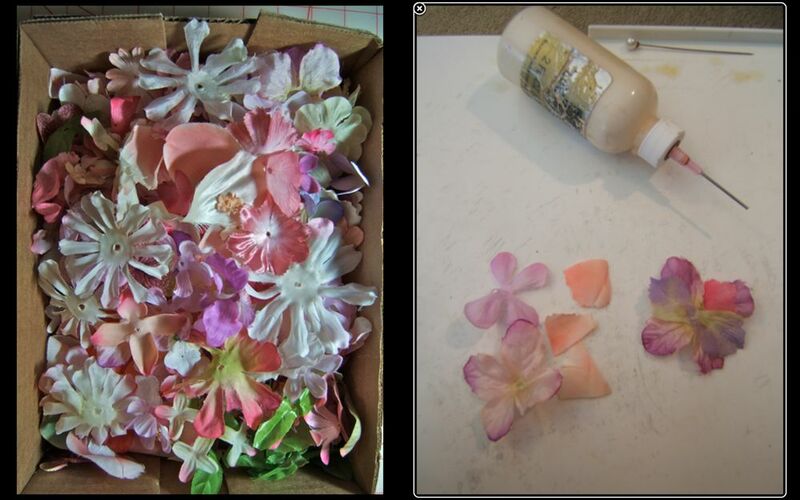 Next was the fun of sorting through all my dismembered silk flowers to find the appropriate petals for the cherry blossoms. They were reshaped and glued into clusters. 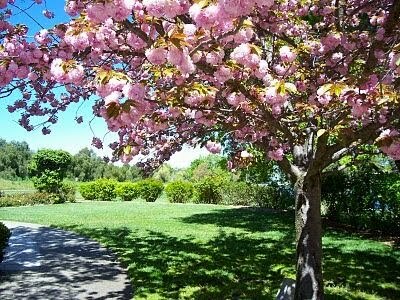 The blossoms were built up by adding one petal at a time. After a drop of glue was added a pin was inserted to hold the petal in position. A couple of evenings were spent making flowers while I watched "Dancing With the Stars" and "American Idol". 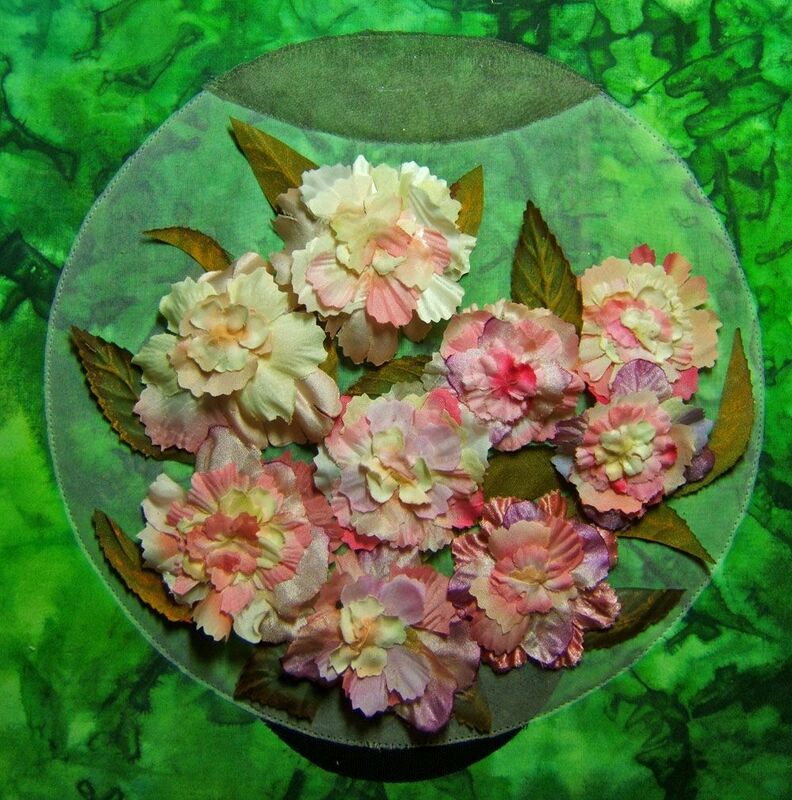 The completed blossoms were arranged "in" the globe. 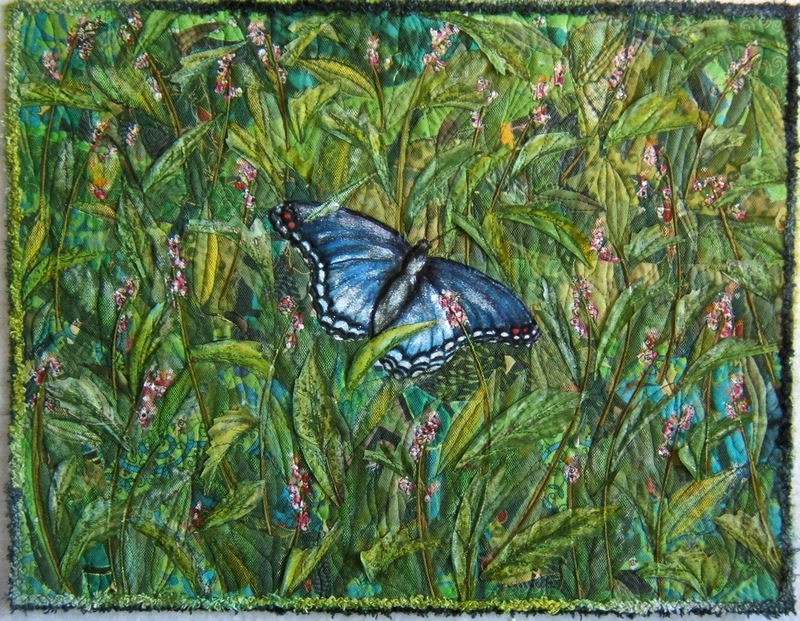 I included silk leaves that were shaded with oil stick pastels. Light blue tulle was layered on top. I machine quilted around all the petals of one blossom, just as I had for these flowers in a quilt made a number of years ago. It looked awful. I think the problem was the scale of the cherry blossoms is smaller than those in "Hollyhocks". I removed those stitches. Then while considering what to do about quilting the blossoms, I machine quilted veins and around the leaves. I liked the look of the petals not being quilted. However, something had to hold them to the surface besides the fragile tulle netting. 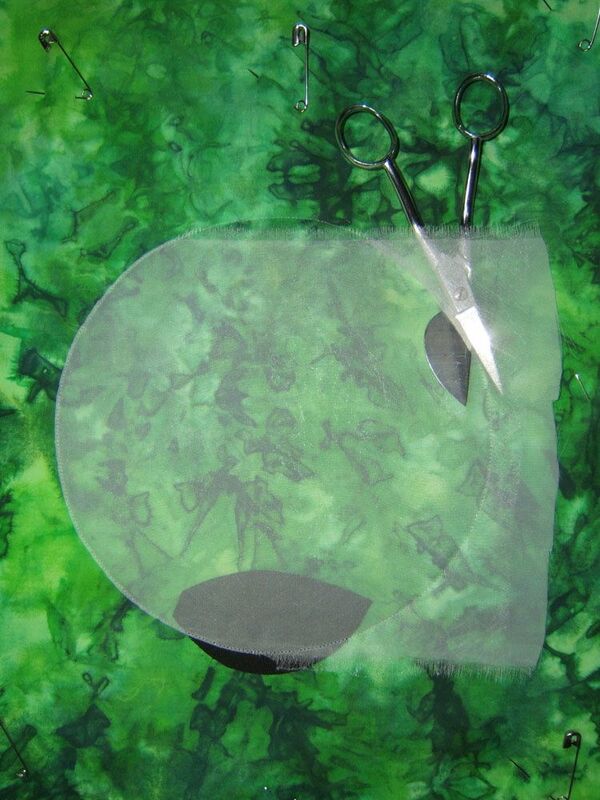 There was a piece of thick clear soft plastic I had saved from the cover of a fabric sample book lying on the table. In desperation I placed it over the flowers on my quilt. That is exactly what was needed. 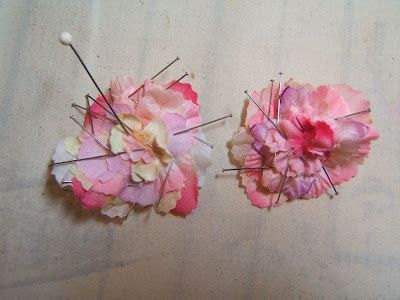 A bit of fabric glue holds each blossom in place. I used a Teflon coated foot for my machine to stitch the plastic to the fabric background (a sheet of tissue paper placed on top would keep a regular machine foot from sticking to plastic). I also lengthened the stitch so I could trim close to the seam and the stitching would hold the perforated plastic in place. A piece of fine shiny iridescent yarn was couched next to the edge for a neat finish. 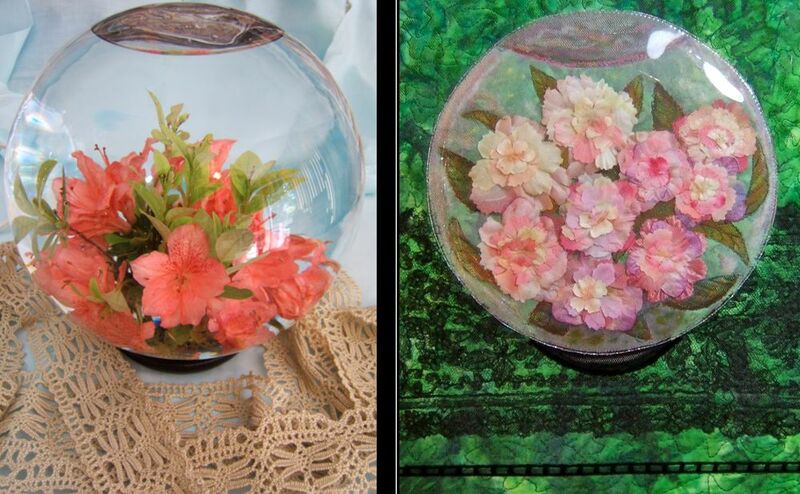 I could hardly believe how the fabric flowers appeared so much like those immersed in the real globe vase. They appear to be magnified by water. Plus, the surface of the plastic reflects light just like the glass vase. The shadows cast by the cherry trees immediately brought lace patterns to mind. This is the same antique lace that drapes one of the doll figures in my March interpretation, "Waiting". It serves to form a foundation on which the vase is displayed. 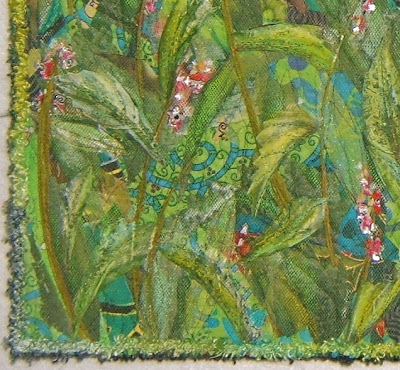 Patterns in the batik background are shaded with oil stick pastels to suggest the shapes of the trees in the background of the photo. The edge is finished with couched yarns. I like the result of my novel solution for the globe, but doubt that plastic sheets will become a commonly used material for future projects. On The Forest Floor - 17" x 13"
Where this beautiful blue butterfly was photographed by Karen was the first and strongest thought in my mind, for I have walked in the Forest Preserves that thread through the suburb's of Chicago. That initial thought wouldn't leave my head so I took on the challenge of portraying the forest floor. 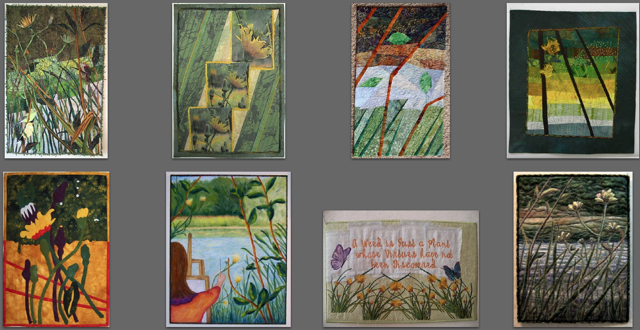 The "groundwork" began with the green scraps I set aside while digging through my bags for pieces to make waves on my BIG lake quilt. I happened to have a bunch of silk grape leaves in my stash. 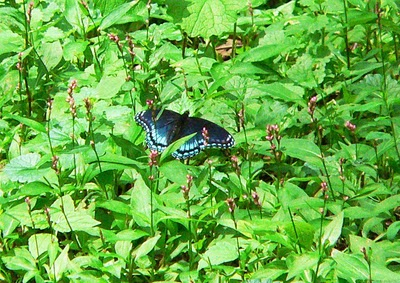 They were cut into long skinny leaf shapes similar to those in the photo. Oil stick pastels were used to give them different coloration. 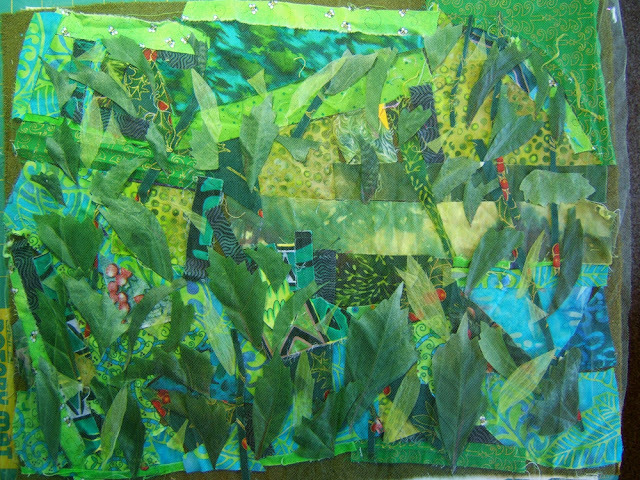 I like to place a piece of scrap fabric under the leaves to catch the excess scribbles. 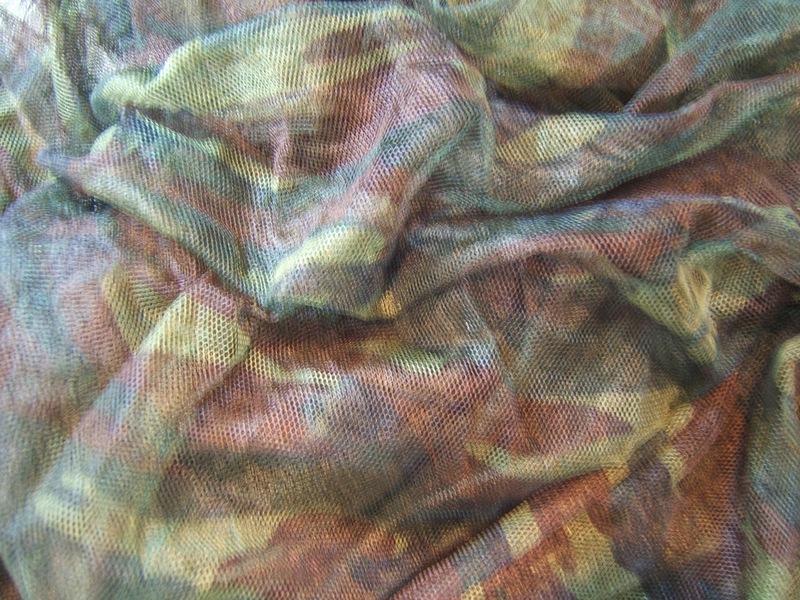 More leaves were cut from a piece of crinkled silky synthetic someone had passed onto me. 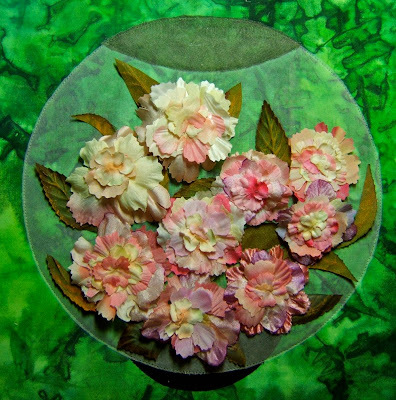 The pink blossoms in the print of an old silk blouse were cut into little circles for the pink flowerettes. The foundation was turned upside down so the lighter values were at the top. A second layer of leaves and flowers were laid on. I went online and searched the net for "blue butterflies". These are three of many photos that I considered. 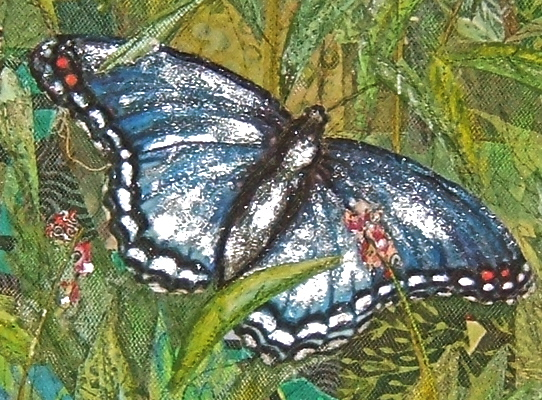 A layer of tulle was placed over the added leaves, stems, flowers, and butterfly. I machine free-motion quilted around the shapes. I knew I would be cutting the tulle away from the butterfly shape, so it was stitched around the inside edge catching the wing fabric. The light green tulle that I used muted those bright blue hues. Many more leaf shapes were cut out, colored, and sewn to the surface through their veins so they stand out in relief on the surface. Mine is a literal interpretation. The composition is arranged like the photo. However, the built up layers and textures add dimension and life that is only imagined by observing visual clues in a photograph. I'm feeling quite frustrated because I cannot show that to you. The above photo is brighter and lighter overall than the real piece, while the photo at the top of this post is darker. The piece I'm looking at in my studio is between the two, since it features both qualities. "Under the Bridge" 13" x 17"
It's the reflections in the water as well as the bridge that captured my attention ... the reflection of the one large building in particular. I had masked that off from the rest of the photo so I could play with Photoshops filters on the top portion of the picture. When I hit on the above combination, I got excited about mixing the realistic reflection in the water with an impression of the actual scene. Woo Hoo! I get to use my "ortwork" collage technique. I printed two copies of the reflection on "InkJetPrinting" fabric by Jacquard. This was because I needed more than one width of the 11" across of that prepared fabric. I rotary cut each of them into sections and then gave those serpentine edges. Then they were combined to portray the building and fill out the dimension to the 13" that all of my IT pieces measure. Those bits cut away from the serpentine edges became reflections in the water ... along with a lot of threads, bits of roving, and "stuff". I let that one building fill the width at the top of the piece. The collage work made the details. The people in Beverly's photo look as though they're having a good time. I added many more revelers partying on the bridge. And then I fell in love with the bridge. I hadn't intended to make it so solid and realistic ... that happened with the quilting. So it has become the focal point. Of course, it's commanding the prime visual spot of just above the center in the composition which ensures attention. Even though my life has been hectically full for the last two months, this challenge piece had been in my mind often. It was physically begun and finished in one day. I had literally "hit a fence" for most of the month in trying to decide how to interpret Debra's photo. My usual playing around with the picture in the Element's filters had not provoked any ideas. Expressing my frustration in a conversation with my husband got me going. He said, "How about playing with the lyrics to that song 'Don't Fence Me In'". I said, "I've already made a quilt with that." He said, "How about putting an animal behind the fence?" I said with a BIG smile, "Yeah! A 'Nelliephant"
I knew there was just the right sized elephant in a printed fabric somewhere in my stash. Finding it got all my fabrics resorted and refreshed in my mind as to what I have stored here at the cottage. All of my IT pieces are the same size, 23"x 17". However, the size of the elephant wasn't large enough to scale the whole picture for this one that big. I cut a piece of batting about 12"x 9" and started layering the background in my "ortwork" collage technique. I was so absorbed in creating this piece that I neglected to take anymore process photos than the one above. That's black tulle making the shadows in the foreground and a bit of blue wool roving for the sky. Strips of various black fabric scraps were cut for the hair. 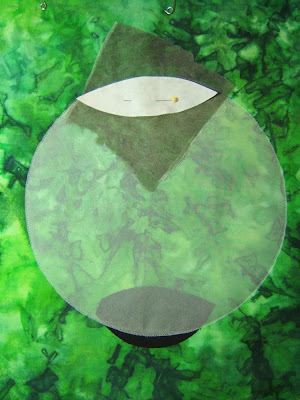 The glasses were drawn on the paper side of a fusible web, then ironed onto black fabric and cut out. The eye glasses were ironed into place. 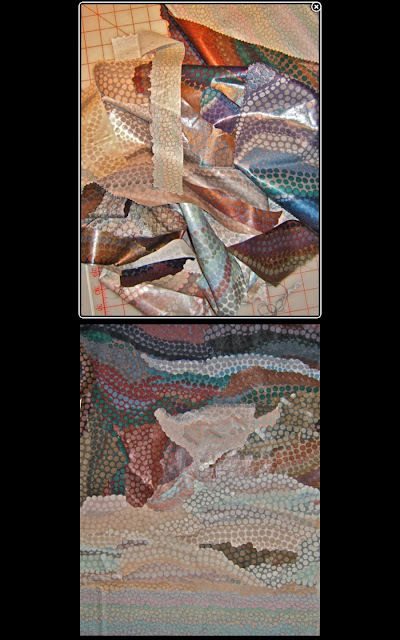 The dots of color were made with watercolor pencils over the tulle netting after the quilting was done. The tip of the pencil was dipped into water and gently rotated in place to leave just a dot. Face color was added with oil stick pastels. 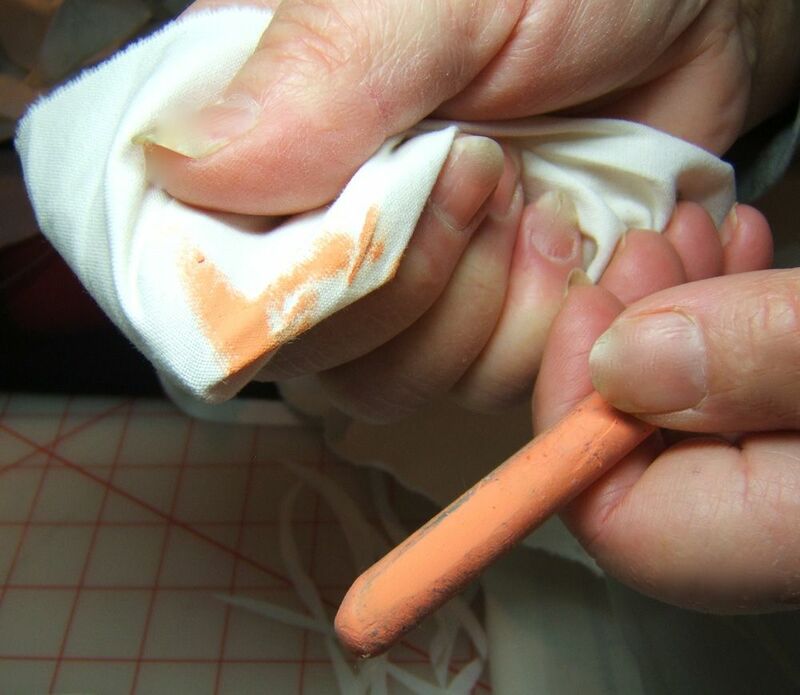 The pigment was rubbed into the fabric through the tulle with a stiff stencil brush. An eyebrow and lashes were drawn in with ink. The glasses strap is yarn laying loose on the surface. The earring is a jump ring with a metal charm ... a key to unlock that gate? I played with varying the the layers of batting, as well the sequence of quilting the different areas to get a bass-relief effect. 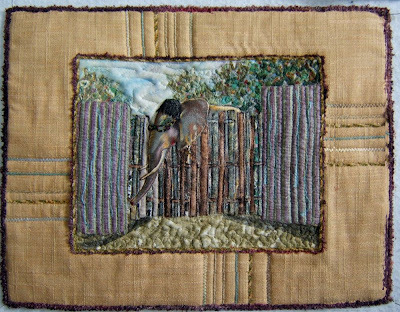 Two additional layers of batting were placed behind the elephant's head and the corrugated metal parts of the fence. I machine stitched around those shapes and then trimmed away the excess batting on the back. One additional layer was added behind the slatted part of the fence. The slats were quilted and the excess batting beyond it was cut away. 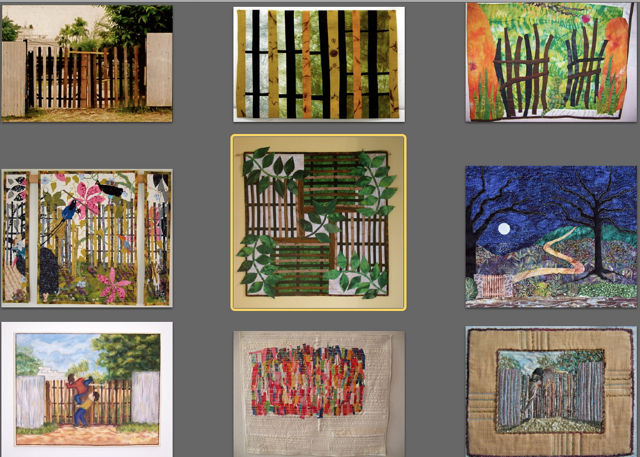 The fence and foreground was quilted first before it was placed on the large beige linen background piece. 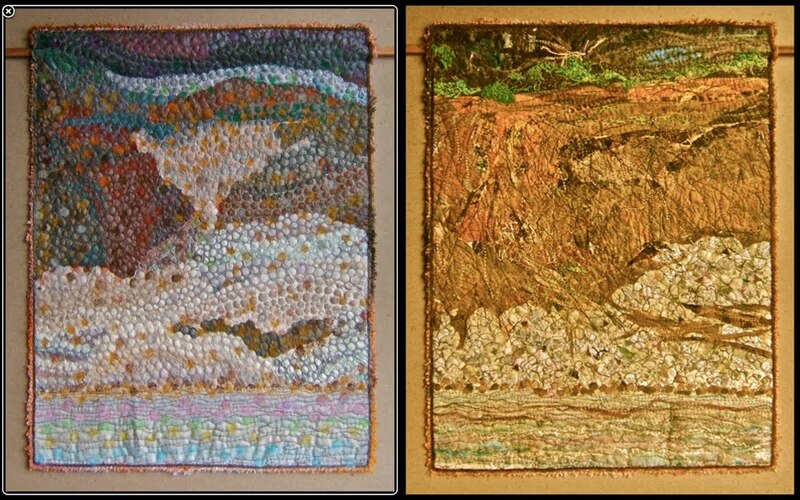 Then the small picture piece was trimmed to size and the edges finished with couched yarns. It was centered on the large beige linen fabric that also had a layer of batting and backing. 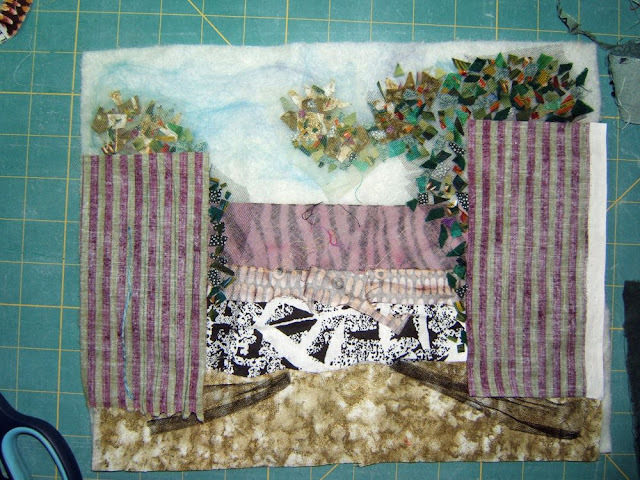 The sky and and trees were quilted through all the layers so that part would be compressed into the background. 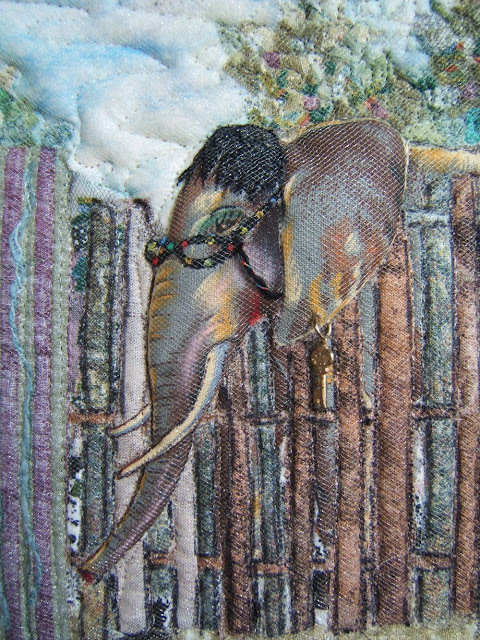 The elephant's head and ear was again stitched around again through all the layers. The corrugated fence parts were quilted through all the layers. In reality it appears closer than the gate. Decorative yarns were couched to surface of the linen on each side through the batting and backing before the picture part was added to it. At the end I outlined the slats of the gate with ink. Using a heavy black thread to quilt them may have done the job. However, I didn't see that they needed emphasis until the piece was finished. This piece ended up being fun to make. It sure does elicit smiles and giggles from everyone who's seen it. 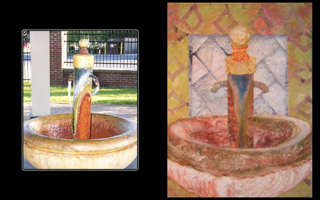 The fountain itself is about the only thing that appealed to me when I looked at Judith's photo mounted on my design board this month ... so I cropped in close to feature it. But first, a background was needed. 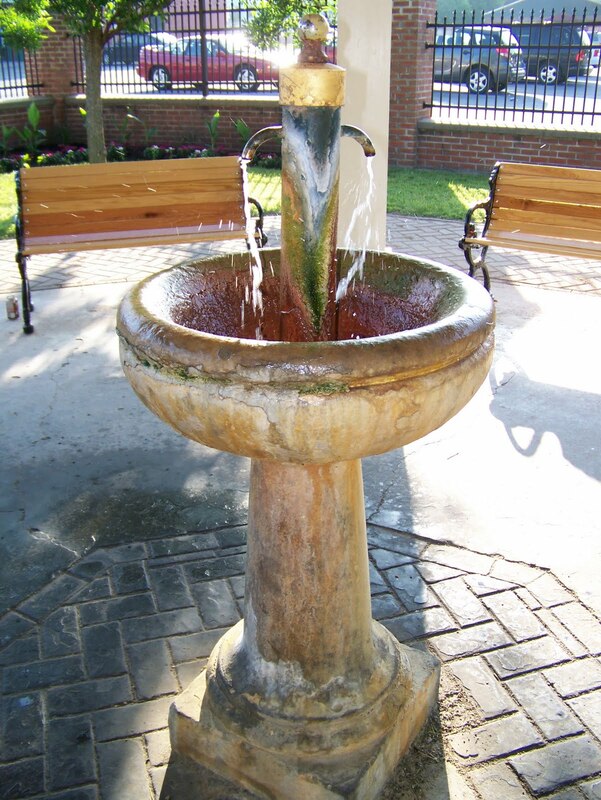 I chose to feature the brick foundation under the fountain. 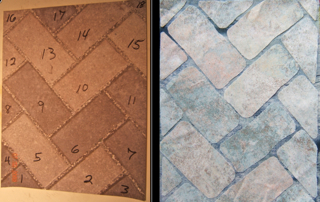 I found a photo in Flickr of bricks laid out in a herringbone pattern. I printed it out on paper and assigned a number to each brick, then cut them apart to use as patterns. The grout part is a whole piece of cloth torn slightly larger to extend beyond the outside bricks. The bricks were held in place on the grout fabric with a temporary spray adhesive. For the background surrounding the pavers, I chose a batik that reflected colors and elements of the surrounding courtyard. A piece of violet colored tulle netting was laid over the background and then quilted. 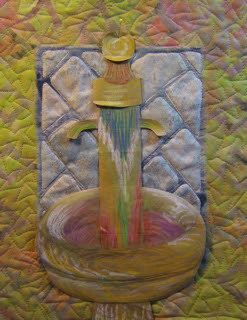 I played with the fountain by cutting out shapes on brown craft paper and coloring in with pastels. The fountain part was good, but the basin was too small. 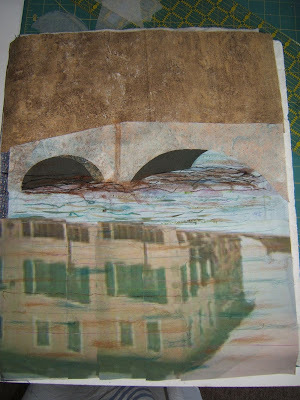 I redrew the basin and used the paper pieces as patterns for cutting the fabric. I can't believe a photo wasn't taken before details and texture were added with wool roving. 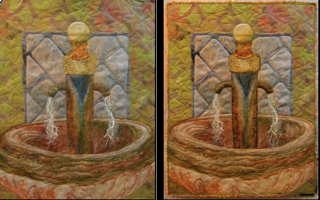 Here it is (before the quilting) next to a photo of the fountain. 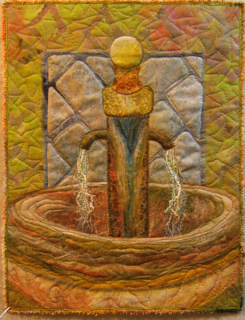 A layer of yellow-orange tulle trapped all the pieces of fabric, roving, and variety of yarns and thread to create the running water. The excess tulle beyond the edge of the fountain was trimmed away after the machine quilting was done. Final details and shading to define edges and highlights on the fountain were added with oil stick pastels. I'm not satisfied with how the front edge of the fountain looks with the quilting. That part may get reworked sometime in the future IF this piece is ever displayed anywhere other than my studio. This month Kim has provided us with a photo of a cottage in Sissinghurst, Encland. After much study of the photo and a lot of pondering, I found it was the patina of the aged wood that very much appealed to me. 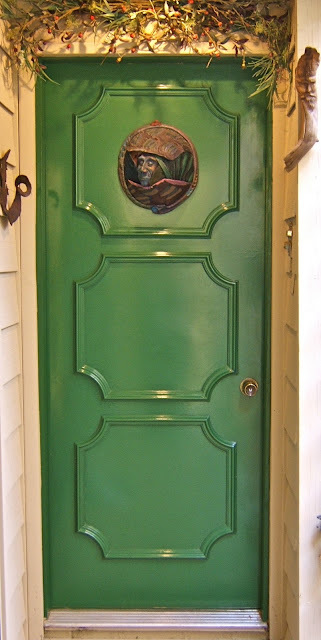 To get layers and depth of texture and color for my door I began with a piece of marbleized fabric. A silver metallic oil stick pastel used to make a rubbing over a course wood grain made a good start. My next decision was to select a suitable fabric for the grout between the bricks. 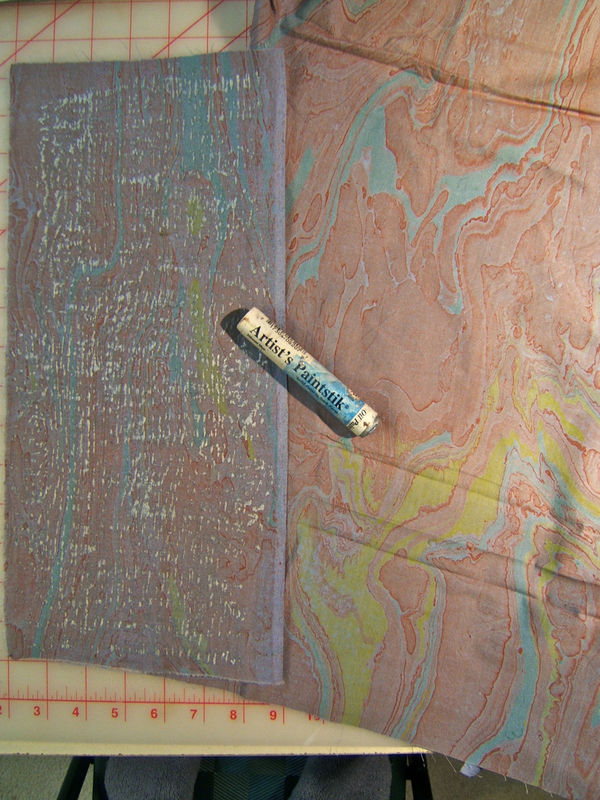 Surprisingly, the back side of a metallic printed fabric in my stash had the gradations that would work. Pieces were cut and laid in place directly on top of the batting. 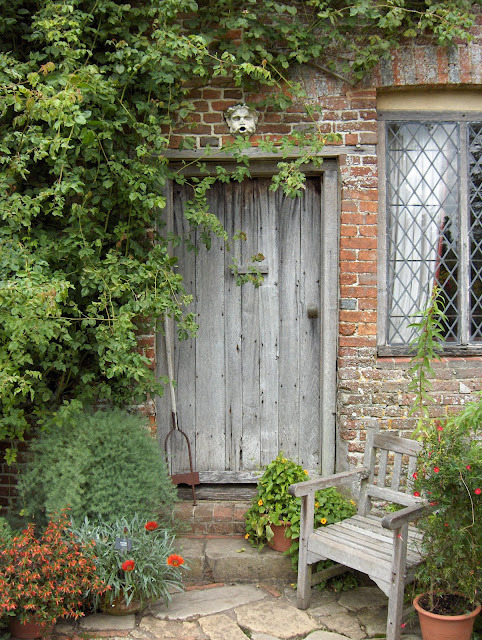 The prepared door fabric was cut and placed in the opening along with the timber frame. Then bricks were cut from the same marbled fabric the door is cut from. That, too, surprised (and delighted) me in how wonderfully well it played its roll to portray those old bricks seen in the photo. The bricks were held in place with a temporary spray adhesive. A triangular shaped piece of dark purple tulle laid over the top left corner of the door created a base shadow. I then overlaid another layer of a lighter lavender tulle over the whole piece. Then the quilting began. 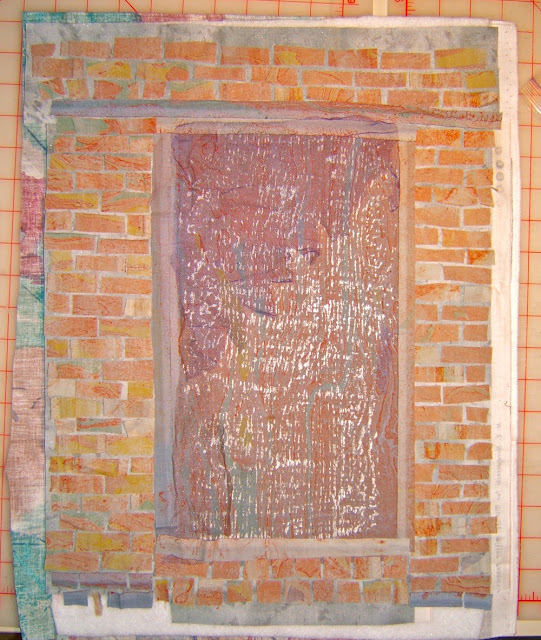 First, I free-motion quilted around all the bricks. Then a variegated yarn that had a strand of metallic thread was couched to define the boards within the door and it's frame. I used a thin irregular black cotton yarn along the top and bottom of the door frame. 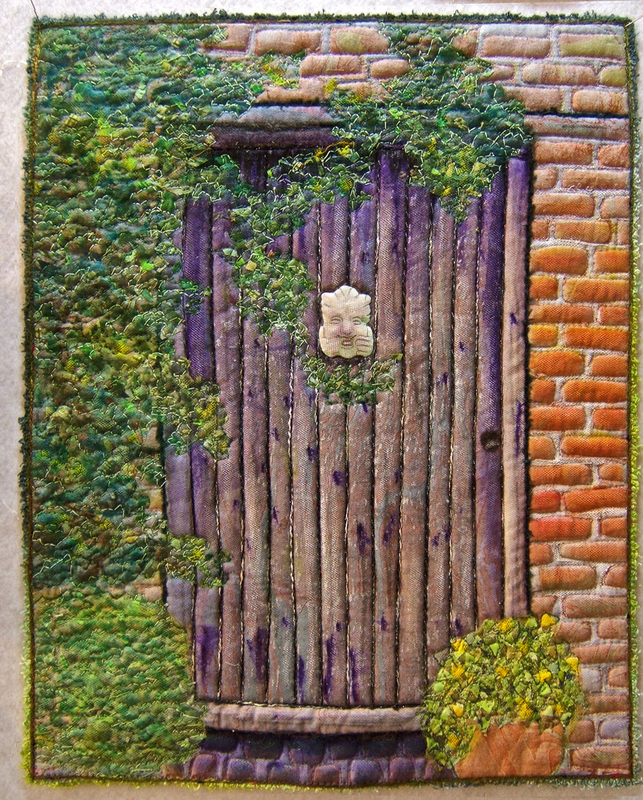 Water color pencils were used to add more texture as well as deep shadows to the door. More shading was done with oil stick pastels. 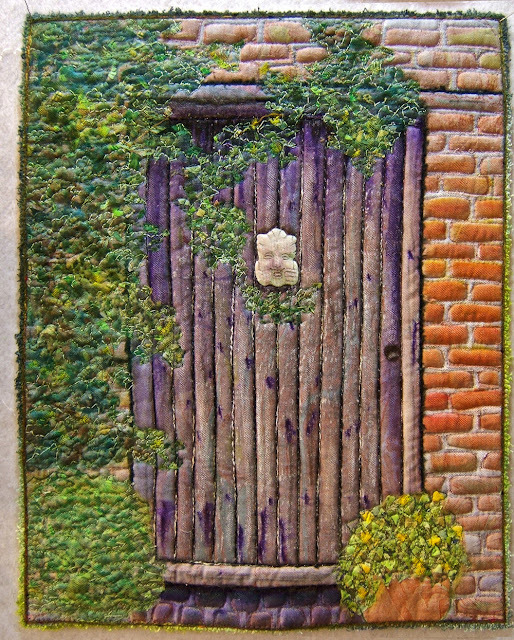 Water color pencils were also used to deepened the orange color in the section of bricks next to the door. That stronger color balanced the block of green on the opposite side. The greenery was created by cutting up many different green pieces from my scrap bags. Each section was composed and quilted separately. Each has a different color of green tulle overlay, as well as different greens for the "crumbs" to help differentiate the plants. 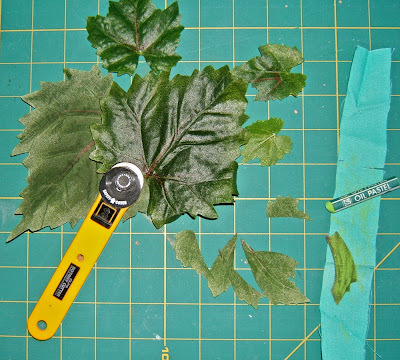 Different quilting patterns also helps to define each kind of plant. 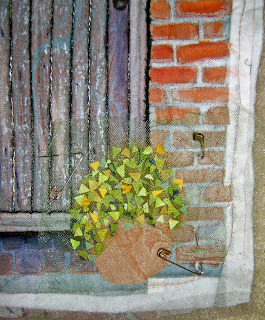 The potted plant in the photo below is ready to be quilted. The excess tulle will be trimmed away afterward. 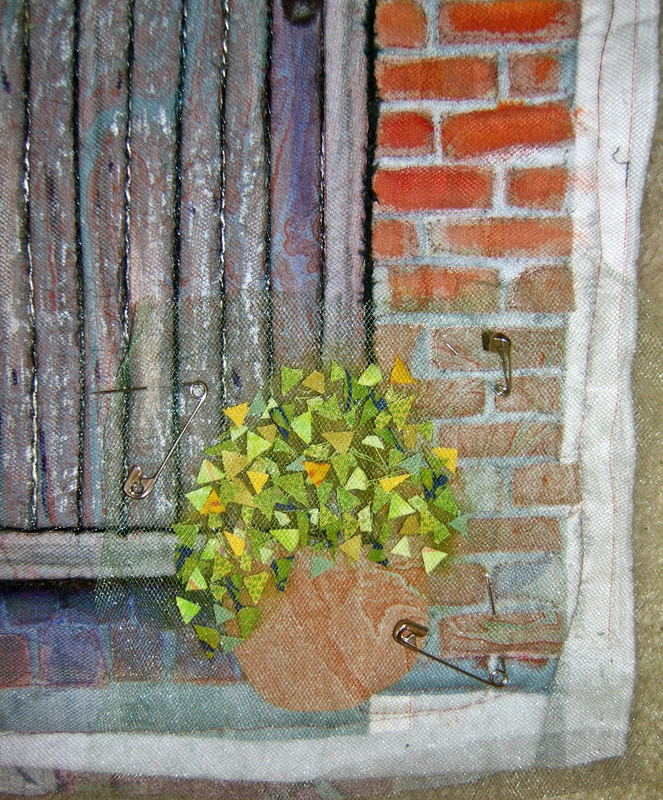 There's a bit of oil stick pastel work to punch up highlights and shadows in the various plants, as well. Note the terracotta pot in the above photo is cut from that same marbleized fabric used for the door and bricks. 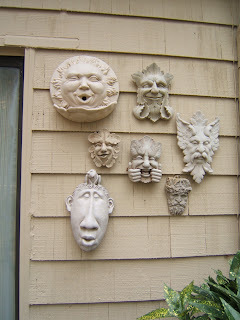 ... and used a photo of one of the stone faces that hangs on our patio wall. It was a struggle for me to get started with this one. The photo features an idyllic setting that is almost too perfect and too pretty. 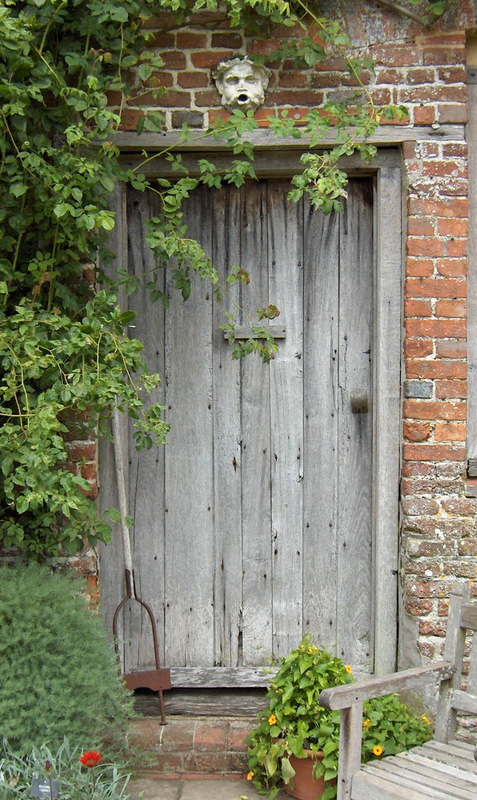 Narrowing my focus to feature just the door let me get "into it" ... let me enjoy the journey of interpretation. 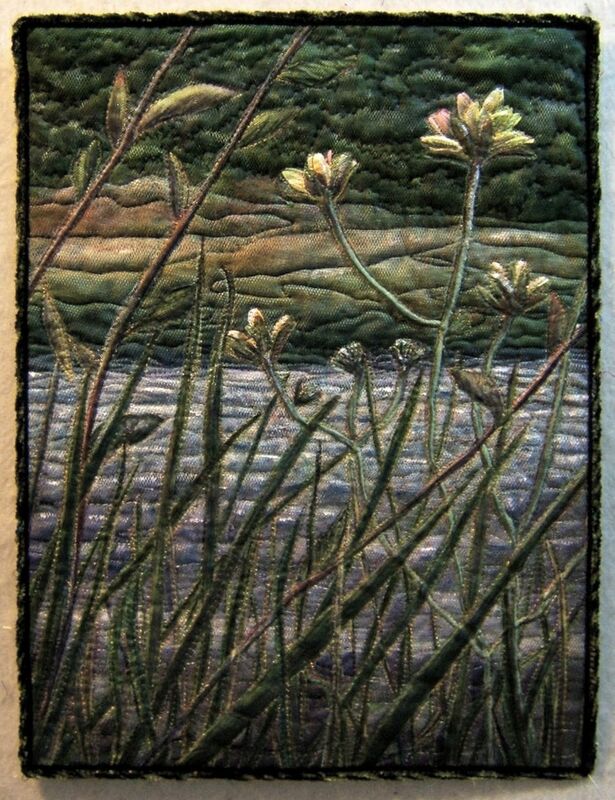 Moon River - 13"x 17"
There were a couple of events that led me to the idea of interpreting Barbara's photo of weeds along the Mullet River in Plymouth, Wisconsin under moonlight. One was the winter solstice in mid-December and the other was this piece that was the result of "just playing" (read about it here) earlier that same month. To get started I played with the picture in Photoshop Elements. 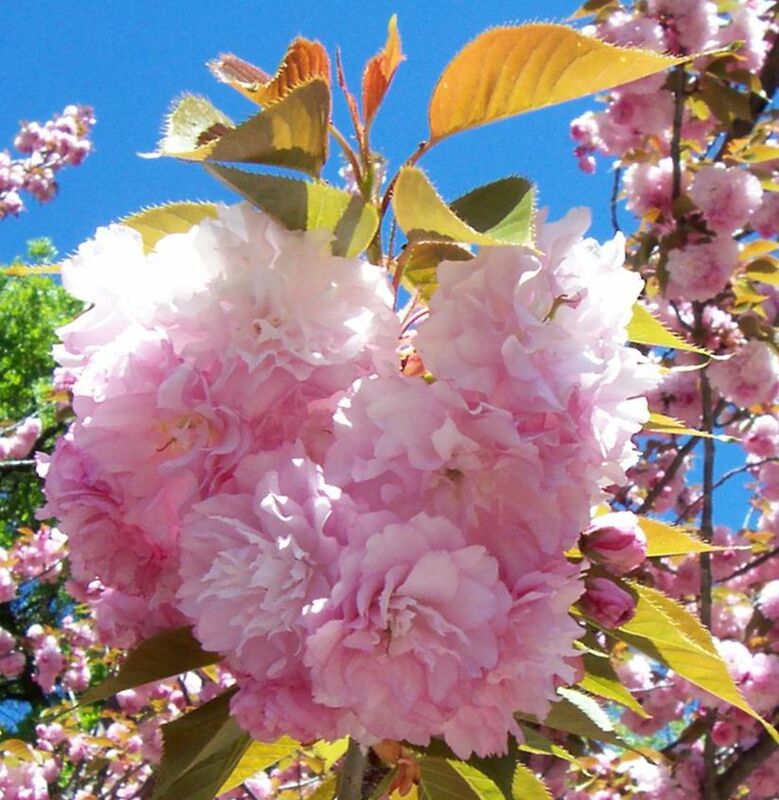 I flipped the photo to change the direction of the angled lines and position of the blossoms. I prefer the focal point to be in the upper right quadrant of a composition. Also, I like to guide the viewing path from right to left within a picture. 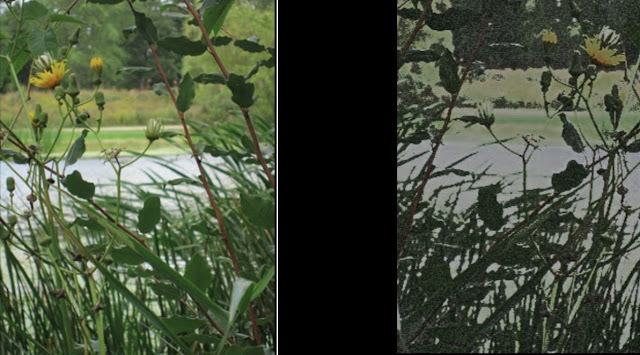 These changes help to keep the viewer's eye circling within the composition rather than allowing them to sweep out that lower right corner. Also, the "hue/saturation" was adjusted in PE to see more the effects of low light conditions. Then I went online looking for photos of "moonlit scenes". Here are three of the many, many pictures that I scrolled through to help me decide how to present this landscape on a moonlit night. I very much liked my bright and fanciful "Moonlit" landscape. 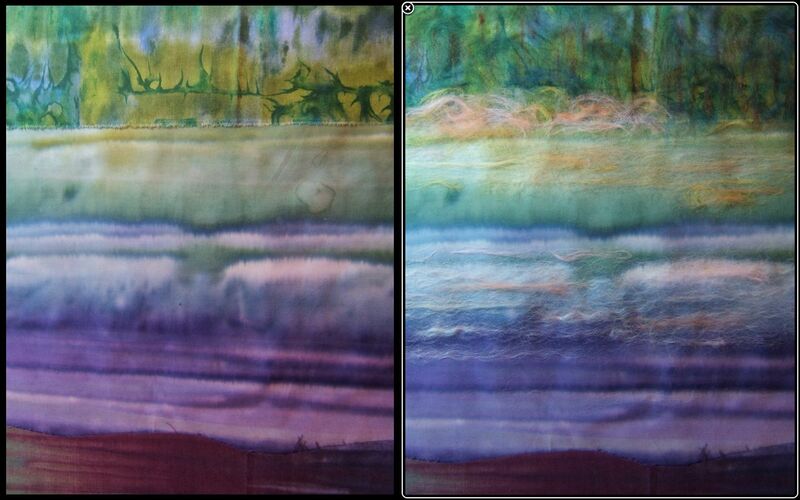 I chose background fabrics that have pure, but watered down hues (left). Bits of wool roving were applied to add softened light as well as to soften shapes (right). Instead of my usual choice of tulle to trap the roving, I chose this netting with a camouflage design printed on it. My thought was that it would add random shadows and spots of light to the composition. It's pinned onto the piece in the picture on the left and you can see the camouflage patterns scattering pools of shadows and light across the piece. 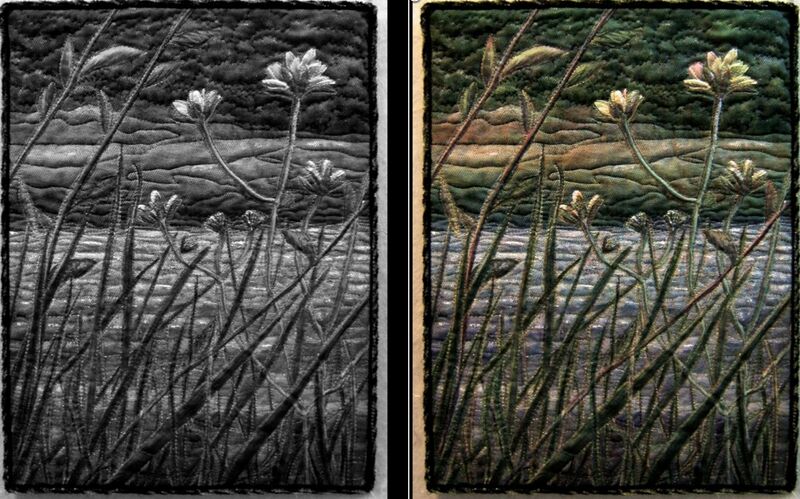 As you can see in the picture on the right, the machine quilting diluted those effects. They're still there, but much more subtle than I had anticipated. On this IT piece I decided to stick closer to realism than the fantasy exhibited in "Moonlit". So I got out my oil stick pastels to darken many shadowy areas as well as to highlight a few areas reflecting the moonlight. At one point, I was dismayed at having lost/buried the wonderful colors and patterns that I had at the beginning. However, I was on a quest to achieve night time effect so I kept going. 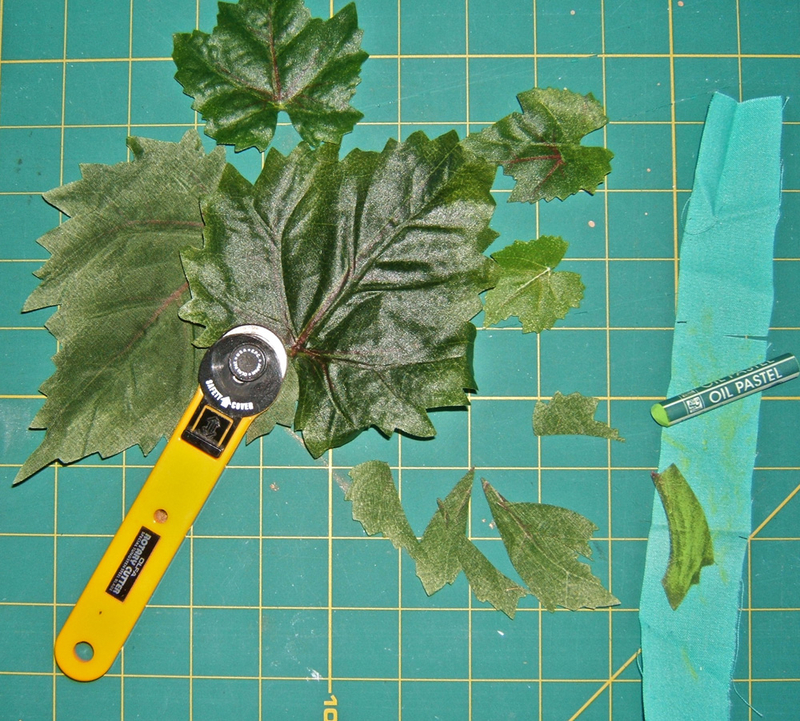 Silk flowers and leaves were cut to shape and arranged over the background (left). A yellow-orange tulle holds all of them in place. 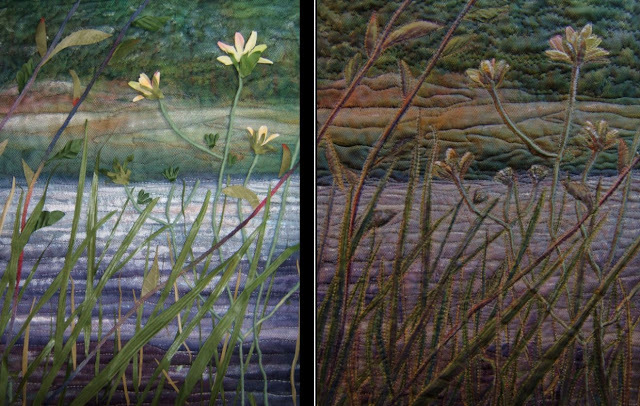 It was cut away from the background areas after the machine quilting around the plants was done (right). And then more ... much more ... work was done with the pastels and paints to get the effect of seeing colors and shapes on a moonlit night. All along the way through this creative adventure photos were taken. Converting them to black and white let me see whether I maintained a contrast as well as a balance of lights and darks. I wish you could see this piece in person. There's a softness to this dark piece that doesn't come across in the photos. The few who have seen this in person react with an intake of breath and say, "It's moonlight!" 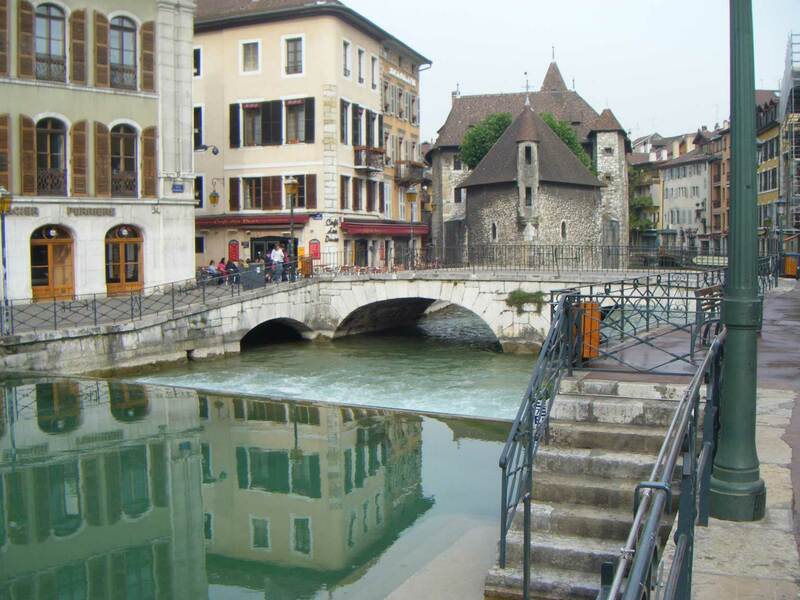 The piece that best exemplifies all of my creations for this year long challenge to interpret a chosen photograph is this one of a scene in Annecy, France submitted by Beverly. The physical elements that comprise this interpreted picture are a combination of my signature "ortwork" technique with an ink-jet printed portion of the actual photo. The piece is readily recognizable as my style as well as the particular place presented by the photo. It represents my perceived intent of these challenges for the group. The line of thinking for my approach to these challenges is akin to how musicians interpret, or translate, a musical score ... a successful interpretation being one that's recognizable as the composition written by the composer. I very much enjoyed the monthly adventures in exploring possible view points and techniques to meet the challenge. One direction that was new to me, and that I took often, was using the computer as a design tool. Previously, it had only been used to check out the values of a composition by converting a photo to black and white. Using the computer is now added to my "tool box" of skills and will be readily considered in making future work. You may have noted that all my pieces are the same size, 13" x 17". The first one, my self-portrait, just happened to end up those dimensions. That size fit the place mat setting for the plate of Chinese food of the first photo challenge, so I used it again. 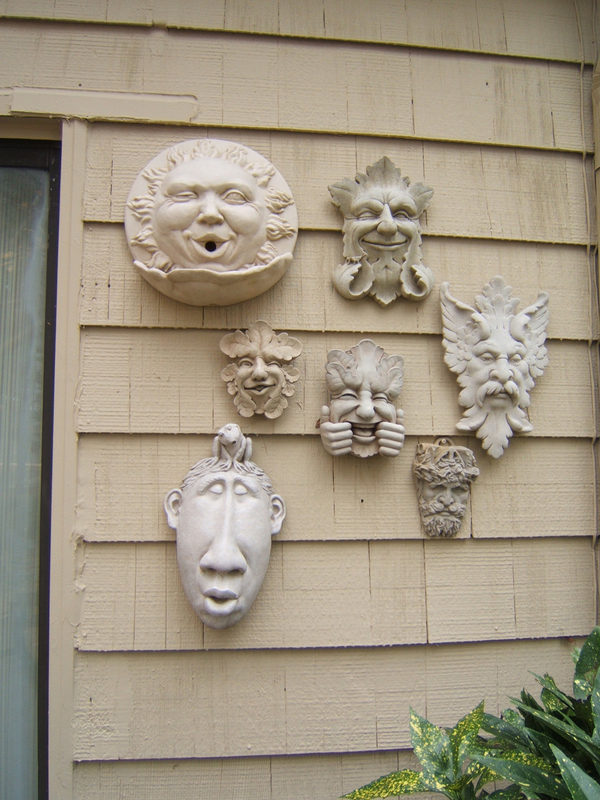 After that, I designed each piece to fit this format either in a vertical or horizontal orientation. A consideration for an exhibition of all these pieces was part of my thinking, too. The piece that I had the most fun with is this one. Before taking part in this challenge I had never considered working from a photograph. Now I realize that it's possible to incorporate my view and techniques to make a unique piece that still relates to its source. This success, plus enjoyment of the challenge, makes me consider the prospect of doing commission work ... something to which I had previously said, "NEVER". I will miss being a part of the monthly reveals. Finally letting everyone see what had to be kept under wraps for the month was as exciting as getting to see my fellow participant's results. I loved that!